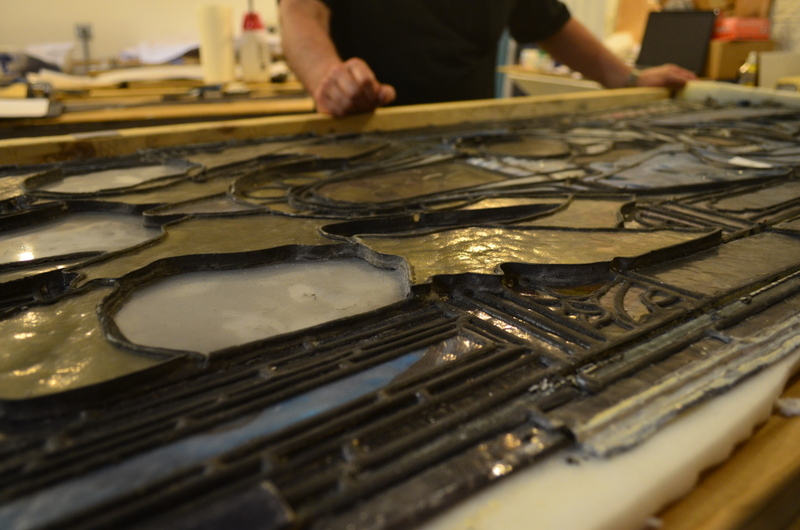 The Lyn Hovey Studio, charged with the restoration of all the figural and cathedral glass in the nave and chapels at All Saints', is now hard at work restoring the last window–Henry Goodhue's the Adoration of the Magi and Shephards. 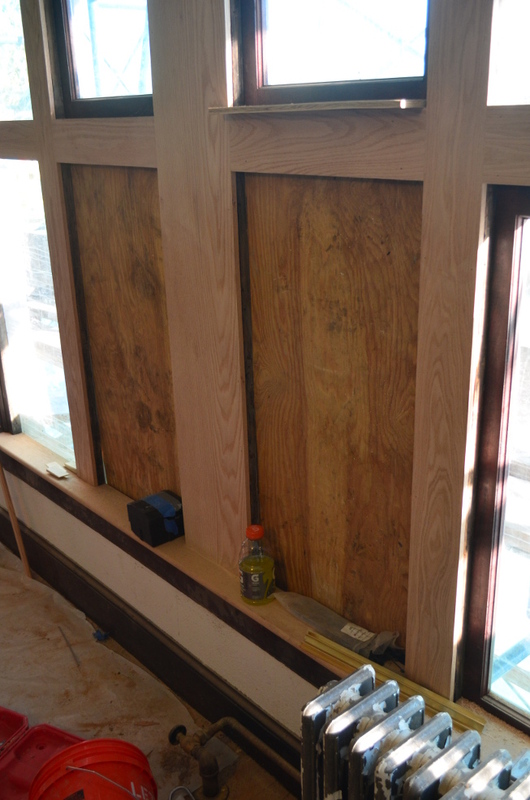 See the early September update (here) for a brief history and description of this window. The undamaged face of the central angel. 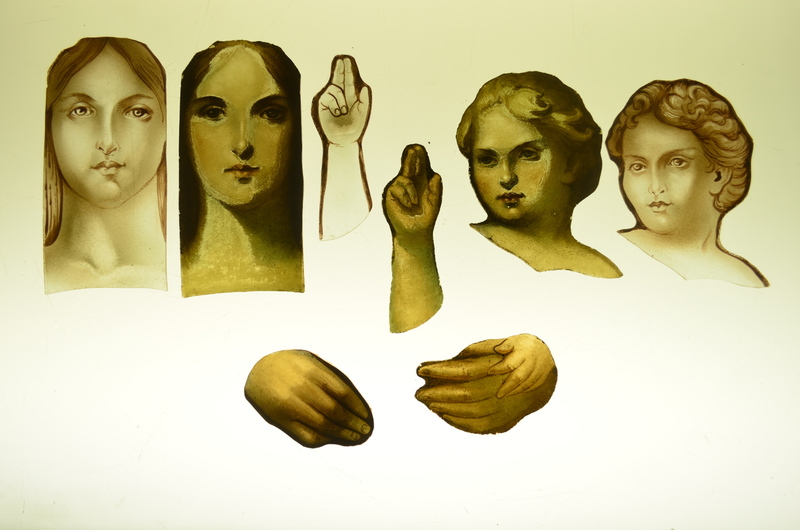 This was used to gauge the original values and shading of the damaged faces and hands of the mother and child. Among the depredations suffered by this window was the "scarring" on the faces and hands of the central figures of the mother and child. The paint used for these features has failed substantially. Our Lady seems to have contracted alopecia at the central part in her hair and a biblical leprosy on her face, neck, and hands. The Christ Child seems similarly afflicted. The In Tray and the Out Tray. 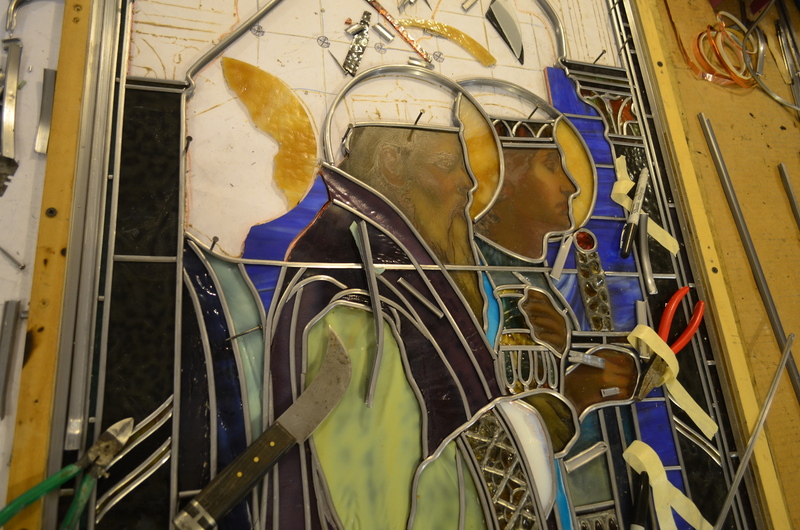 On the right are the pieces from the unzipped panel, depicting the Magi, that remain to be set into cames in the assembled panel shown on the left. 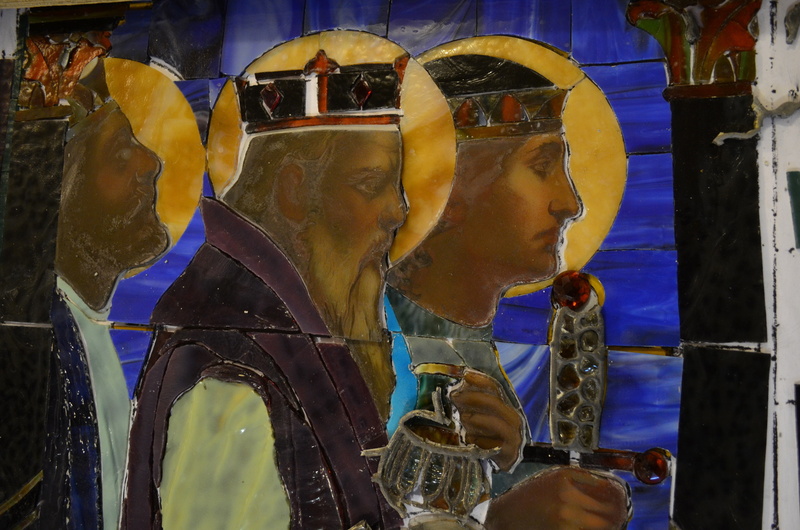 On the right, notice the copper-edged, plated pieces of lapis lazuli sky above the kings' heads. 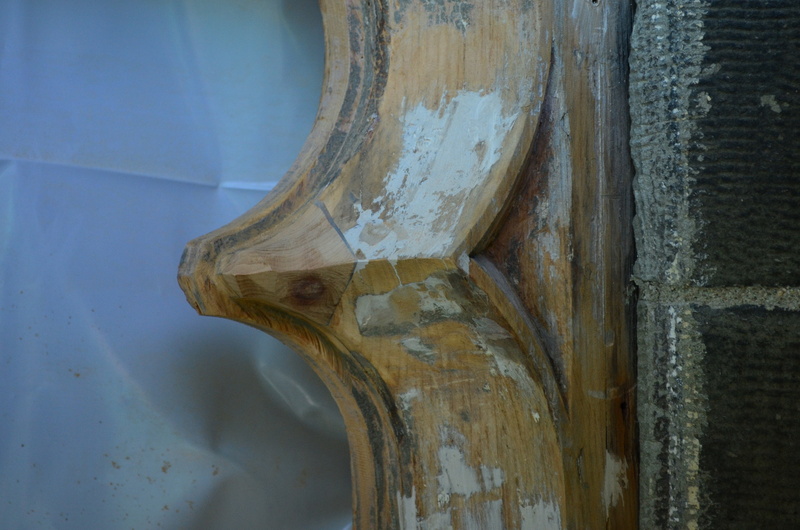 The restoration technique for this is complicated and challenging. It is important to preserve the historic material of the window. So the remedy for these visual defects caused by age and dirt is to do no more than clean the original glass. 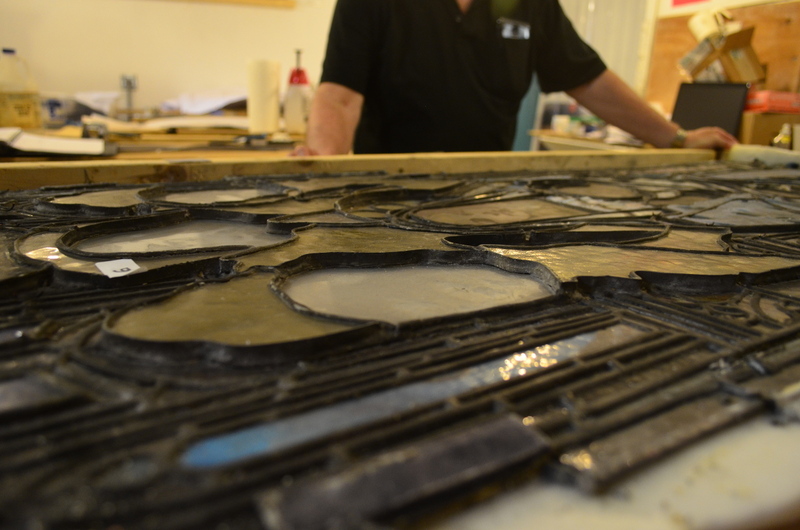 Instead repairing the defects directly, a new layer of glass will be plated to the interior of side of these pieces. These new pieces have been reverse painted with line detail and matte painting to visually supplement the areas of paint failure in the original glass. Another view of the edges of the plated pieces of sky. 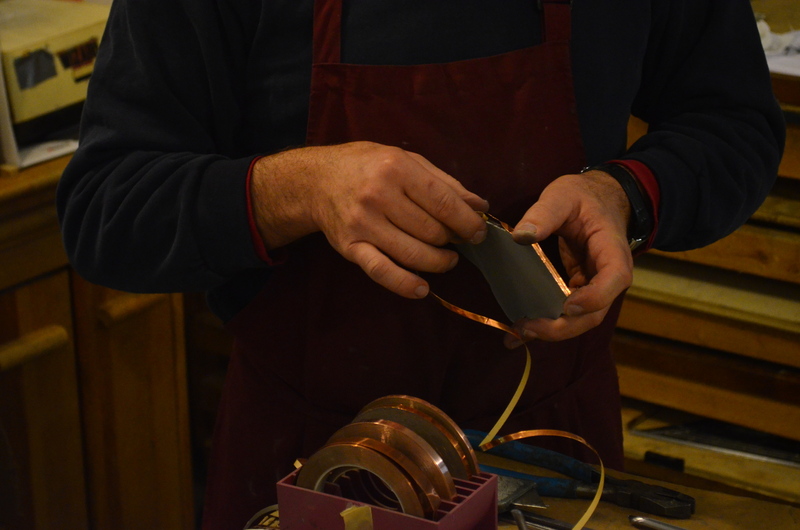 On the right, copper tape being applied. It is a particularly difficult challenge to restore the work of the original artist, for the second, restoring artist must paint the new glass to exactly match the painting on the existing glass. This painting is reverse to the original composition and the artist must add only so much as will restore the original definition and value intended by the window's first artist, without overwhelming the original work. Reverse-painted glass for the faces of the mother and child and for his blessing hand. The mother's hand has already been plated with its reverse-painted repair. 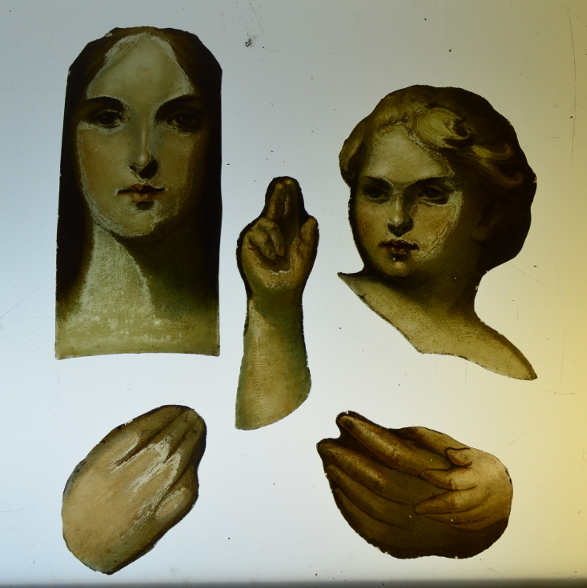 The glass piece depicting the two hands has not yet had a repair painted. Click on any image to see it larger. 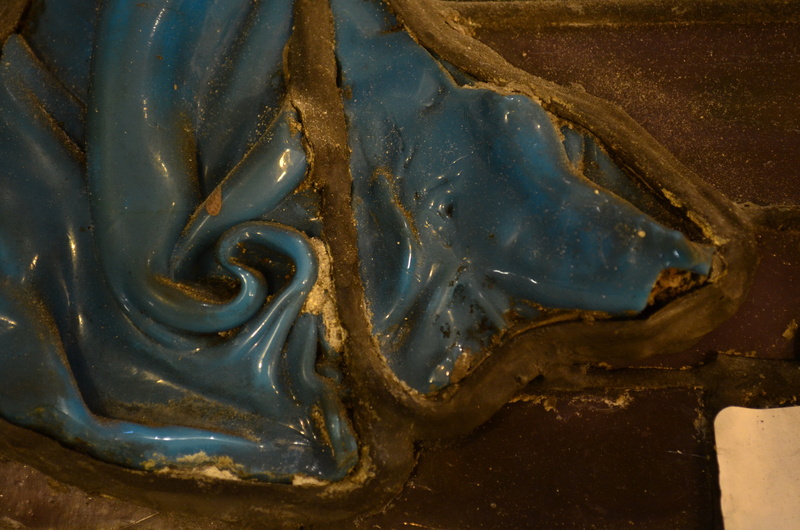 Here the painted glass has been set on top of the damaged historic glass forming a sandwich, with the old and newly painted surfaces in the center, protected against future infiltration of dirt by copper tape laid around the edges. 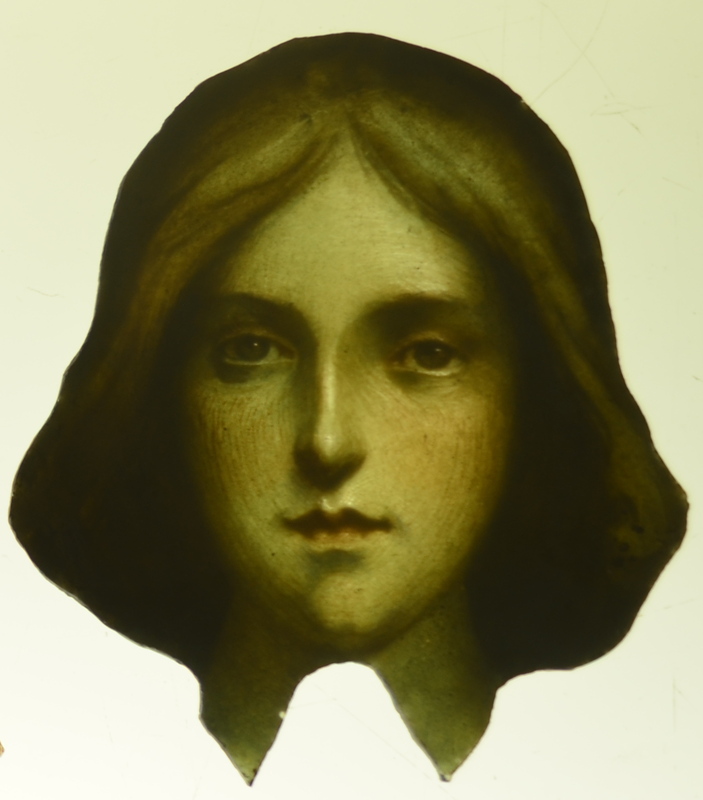 Placed on a fluorescent light table, this photograph suggests the appearance when re-installed. 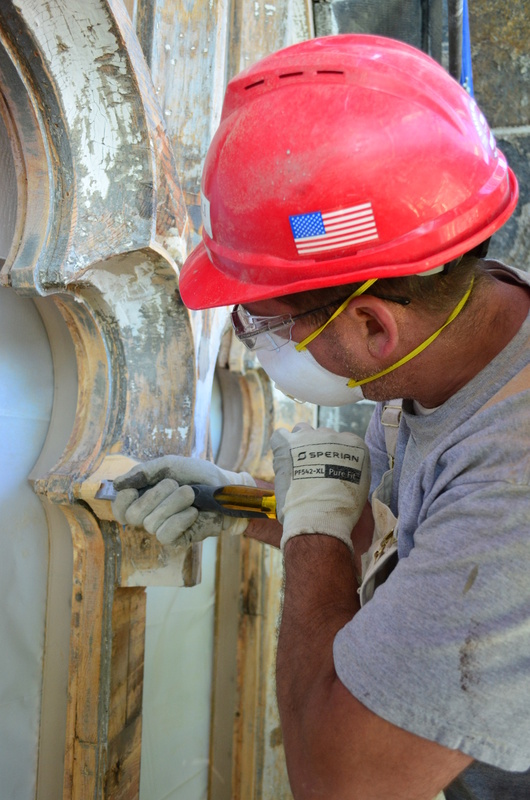 This same technique will be used in a more speculative way in the restoration of the more greatly damaged architects' window. 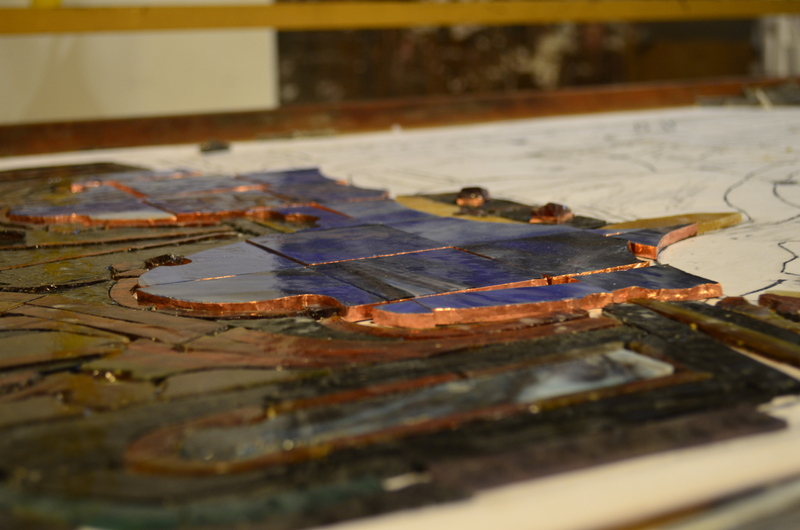 Once the reverse painting is complete, the new piece is plated to the original piece, and copper tape is applied to edge of the two pieces before being reinserted into new lead cames. In fact, throughout this window, in every place where the original craftman employed two-, three-, or four-ply of glass, these edges will also be sealed against infiltrating dirt. Prerestoration transmitted light photograph of the Harry Eldredge Goodhue Adoration window in the west side of the first bay of All Saints' Ashmont. Click on any image to see it larger. 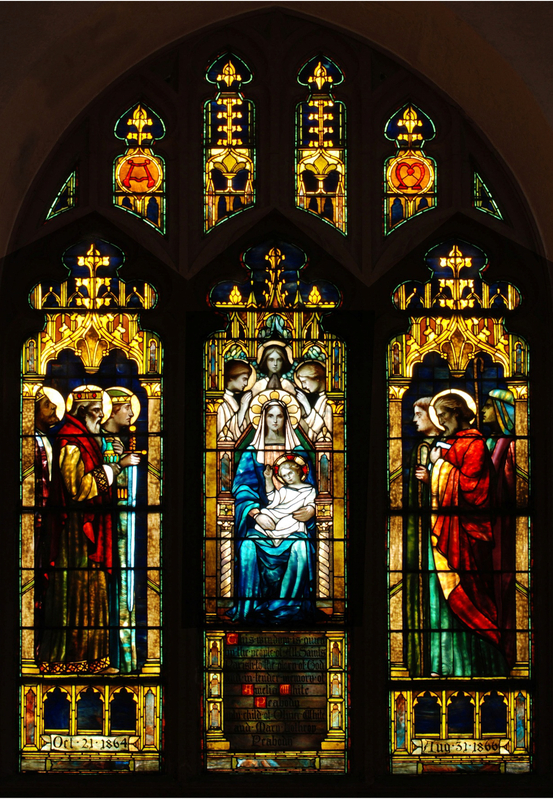 The last major stained glass window to be restored is the 1896 Adoration by Kings and Shepherds by Harry Eldredge Goodhue and manufactured in the studio of the firm Phipps, Slocum & Co. Like the architects' window, it constructed of layered or "plated" opalescent glass. Different to antique and cathedral glass in the rest of the church, opalescent glass is "characterized by a milky opacity." In this window, paint is used only on the flesh and inscriptions. Jewels are used to embellish the hems and sleeves of the kings' robes, and drapery glass is used for clothing. Some jewels are made by pressing molten glass into smooth or faceted steel molds. Other jewels are faceted with hammers. Detail of the left lancet showing kings adoring the Christ Child in reflected light. Notice the jeweled haft of the sword in the beardless king's hand, the jeweled urn held by the central king, and the two lozenge-shaped jewels in his crown. 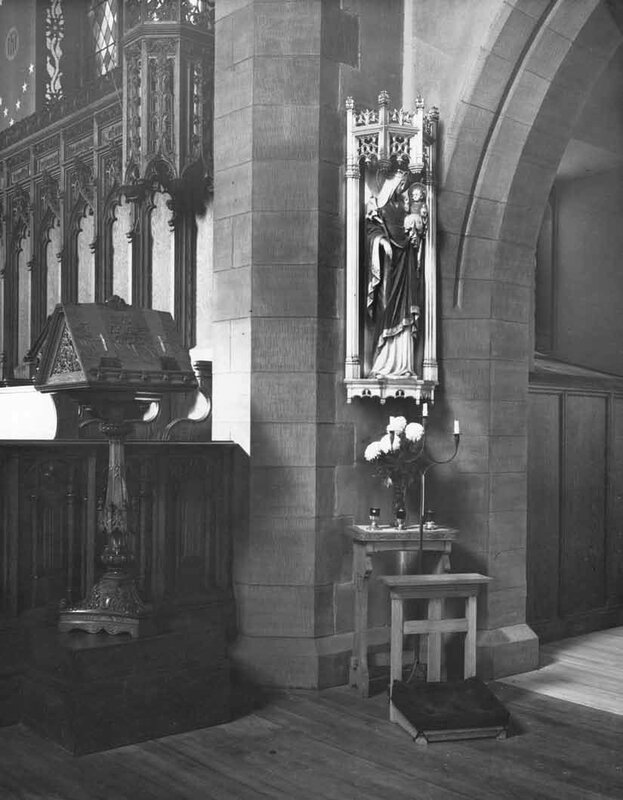 The window was originally planned to occupy the opening above the altar, although within a year of its completion, Cram and Mrs. Peabody were planning a large altar reredos to cover that window opening. King's robe and bottom hem on the left with a closer detail of the jeweled hem on the right. Compare the reflected-light color of the robe here with the color in the photograph of the full window in transmitted light. John LaFarge began using opalescent glass in layers in the late 1870s and Louis Comfort Tiffany is widely known for producing windows with this glass. At the turn of the last century, the rift between those favoring use of opalescent glass and those who opposed it caused bitter divisions in the congregations commissioning new windows and among the artists producing them. Cram came to detest opalescent glass and this window's artist was working exclusively in antique and cathedral glass by the time of his death. 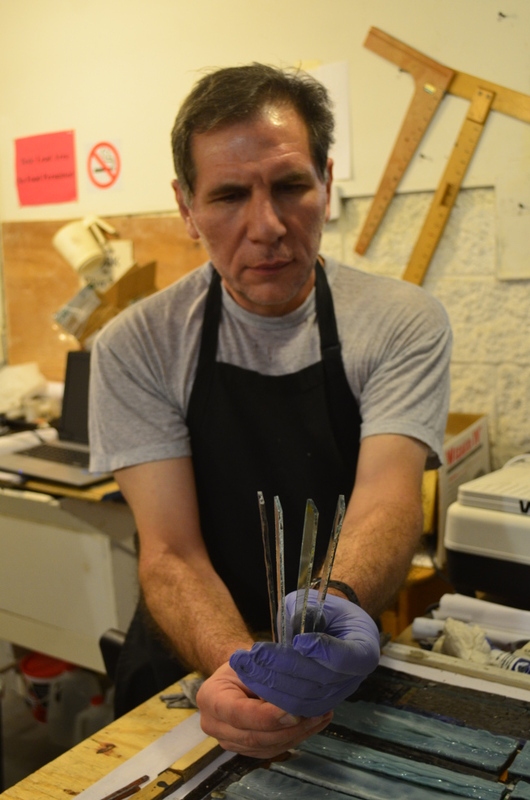 Master craftsman Marat Abramyan holds four pieces of glass that will be plated one on top of the other in the restored window. See the quantity of dirt removed from a plated face by one light pass with a towel. Because they are constructed of two and more layers of glass set in wide-hearted, lead cames, opalescent glass windows require greater technical sophistication to fabricate and they can suffer disproportionately from the depredations of time, a polluted urban environment, and simple gravity. As with all the windows at All Saints, up to now, the Adoration window has not been properly shielded with adequate exterior protective glazing. 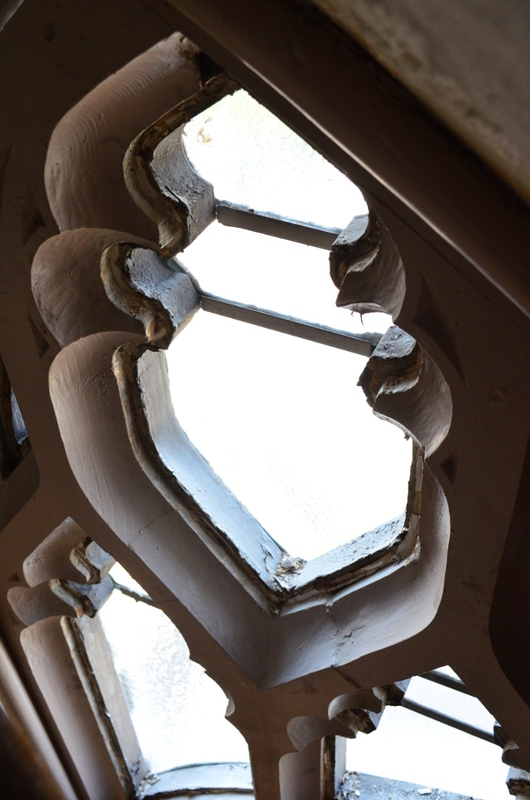 Rather, Lexan sheets were loosely attached to the exterior profile of the window tracery in the 1970s to protect the windows from vandalism. With the exception the architects' window, the Adoration window was in the worst condition and in most need of restoration. 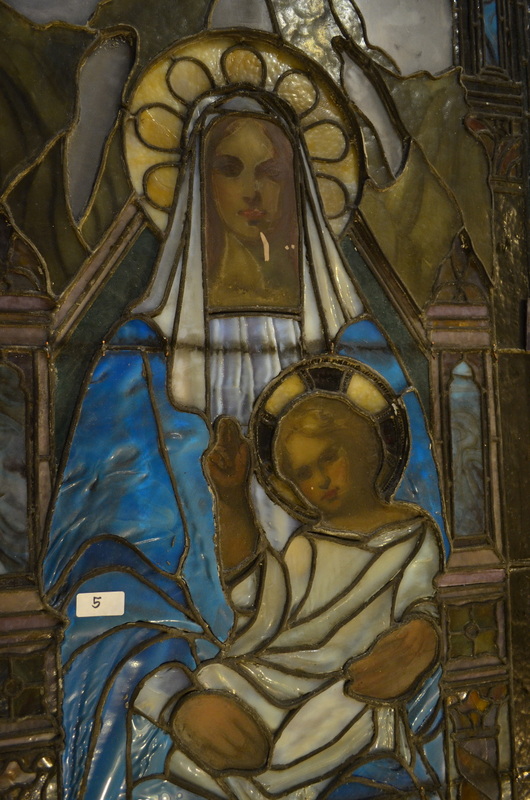 Julie L. Sloan, in her 2011 Condition Analysis of the stained glass at All Saints', noted that this window was is in fair to poor condition throughout, the cames severely sagging, and a heavy deposit of dirt on the interior and exterior surfaces and between the plated pieces. The mother and blessing child on the left. See the careless painter's drip directly across the mother's chin and neck. 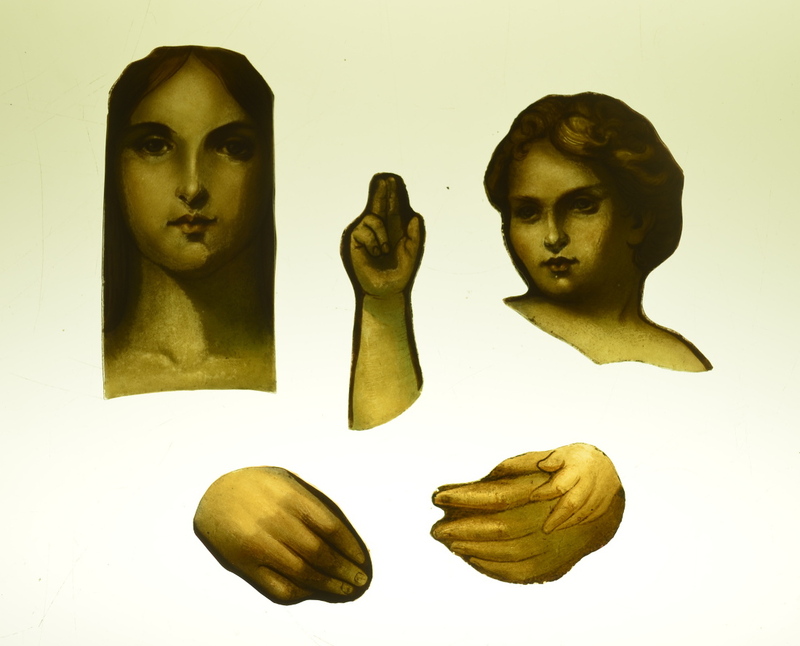 On the right the faces and four hands of the mother and child on a light table. It was with heroic skill that the outside operations crew of the Lyn Hovey Studio was able to remove the three large lancets of this window intact. Each lancet is 26 inches wide and over eight feet tall. They are of great weight because of the two-, three-, and four-ply plating, all with severe sagging of the cames at either the top or the bottom. After arrival at the studio, each lancet, except one, was transferred to a light table for in-studio, transmitted-light photographic documentation. The structural deterioration of the central lancet was so severe that it was not possible to transfer this lancet. The central lancet partially disassembled, with the mother's halo and the three angels' faces and hands remaining. Despite its deteriorated condition, The Adoration by the Kings and Shepherds is much beloved by parishioners of All Saints. It was commissioned in early 1896 by them in memory of Amelia Peabody, the two-year-old daughter of the church's patrons, Oliver and Mary Peabody. The dedication reads: "This window is given by the people of All Saints Parish to the glory of God and in tender memory of Amelia White Peabody only child of Oliver White and Mary Lothrop Peabody" with the dates of her birth and untimely death. In the left lancet, Oct 21 1864 and in the right, Aug 31 1866. The people of All Saints' never knew Amelia in life because she died before her parents ever entered the doors of the old wooden building on Dorchester Avenue. As they became acquainted with the Peabody's grief and perhaps in solidarity through their own losses, they grew confident to claim Amelia's tender memory as their own–an anamnesis. Two slightly different perspectives of the central lancet, showing the raised face of the mother and three white regions of the lower faces of the angels. Click on any image to see it larger. This beloved window further participates in the spiritual life of the parish week by week because it stands above and to the right to the effigy of Our Lady of Dorchester. This statue of Mary and the child Jesus, carved by Angelo Lualdi and installed in 1928, is the focus of the recitation of the Angelus, the concluding devotion at the Sunday solemn mass. 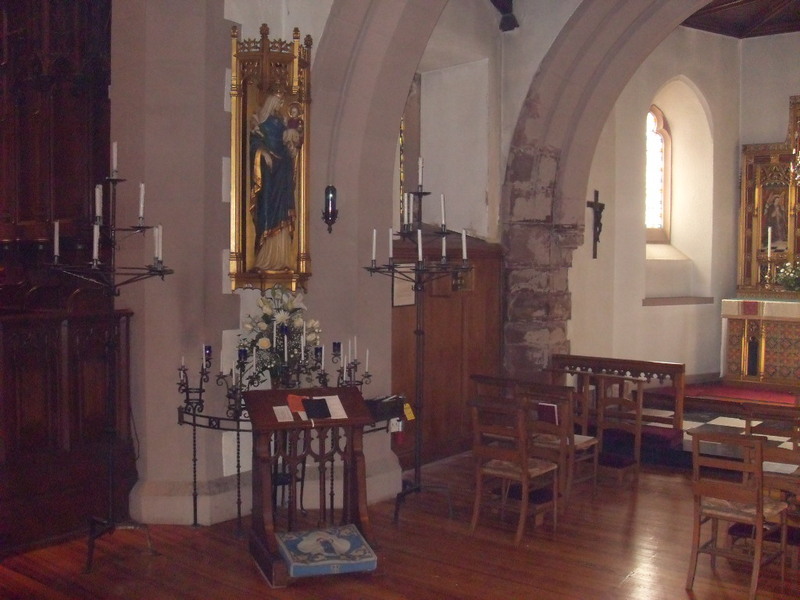 Positioned where it is and brilliantly illuminated by the early afternoon sun, The Adoration by the Kings and Shepherds becomes an alternate focus of devotion for clergy, acolytes, and choir who stand along the Lady Chapel aisle. On the left, a view of drapery glass with one pink piece flipped to show the flat underside. On the right a detail view of the drapery of the bottom hem of the mother's robe. Julie L. Sloan's 2011 Stained Glass Window Condition Analysis, All Saints' Ashmont, Dorchester, MA and conversations with Lyn Hovey form the basis for the first several paragraphs of this article. Since 2009, The Parish of All Saints has been planning for and undertaking a comprehensive restoration of its famous 1892 church–the first major work of architect Ralph Adams Cram. Construction began in June of 2013 and will be complete in December of 2014. Given the immensity of the project's scope, tasks fell clearly into primary and secondary categories. Therefore, however mechanically troublesome and musically inadequate, dealing with the problem of the much-rebuilt chancel organ of necessity fell into the wish-list category far behind failing roofs, peeling paint, and long-overdue building systems upgrades. 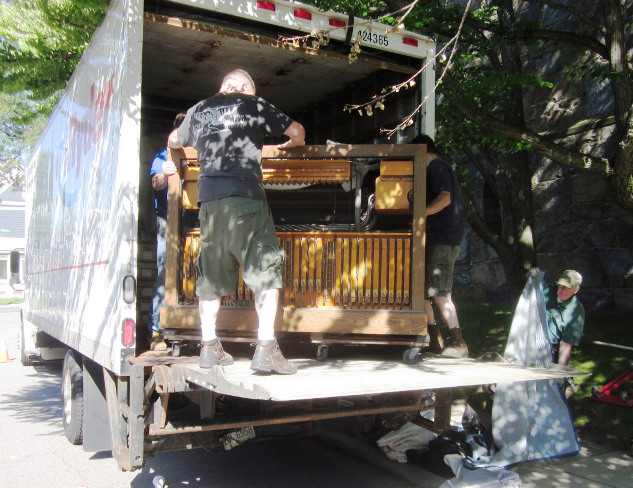 In the midst of planning, however, the Parish was presented with the opportunity of acquiring a vintage 1929 Skinner organ from a closed church in western Massachusetts. 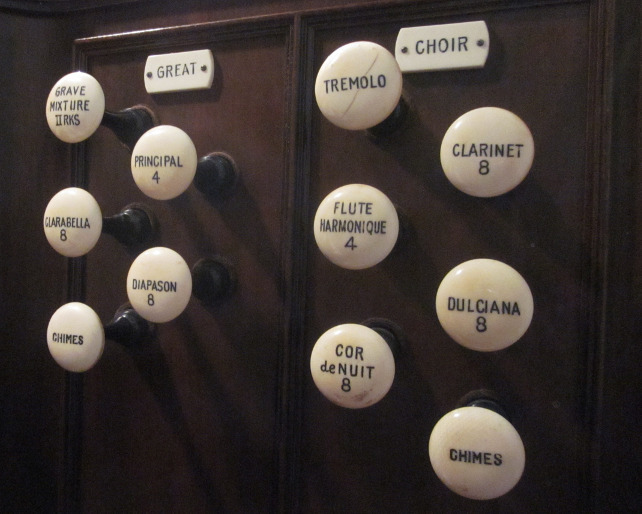 Ideal in size, sound and pedigree, Skinner's Opus 708 would offer a fine solution to the chancel organ issue. 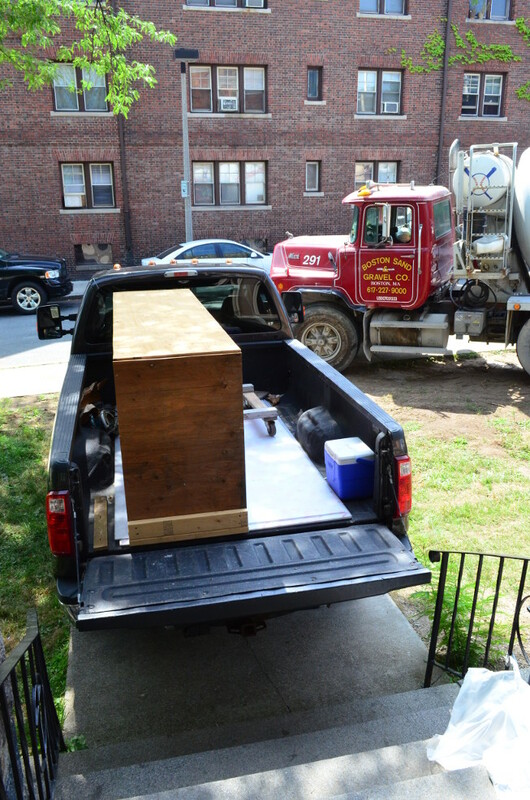 Thanks to an initial generous gift from a friend of the Parish, All Saints was able to acquire, ship and store the instrument, arranged through consultant and parishioner Jonathan Ambrosino, restorer Joe Sloane, and the able help of many volunteers from the congregation. 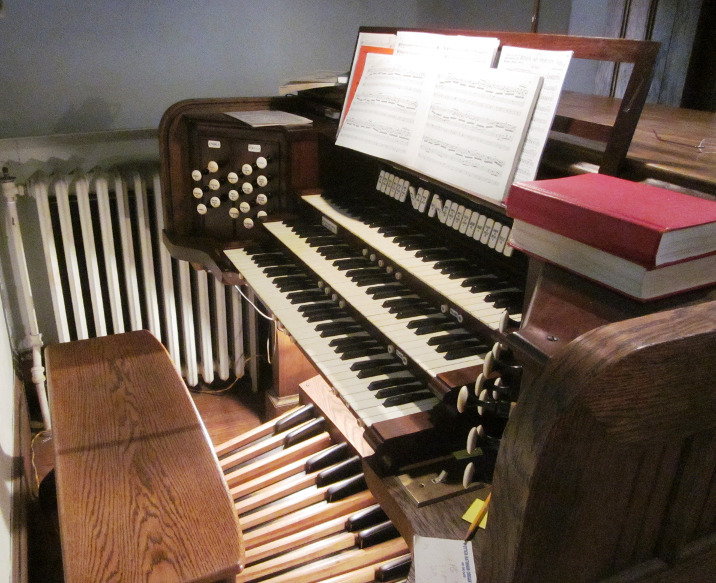 Though initially planned for a later installation, successful fundraising has permitted the Parish to move forward with the project, such that the Skinner will be installed and playing in 2015. 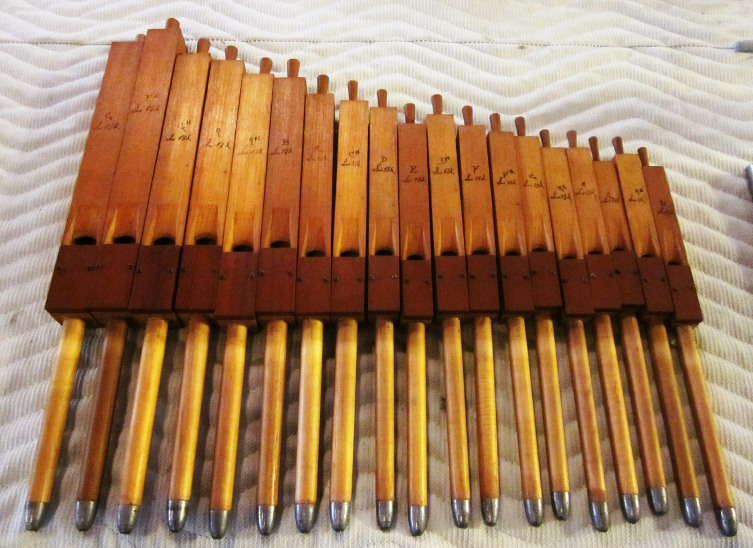 Skinner organs excel at choral accompaniment, which is critical in leading the Parish's rare Choir of Men and Boys, founded in 1888. Although once common in Roman Catholic and Episcopal churches, fewer than twenty such ensembles remain in America today. In addition to helping to lead the liturgy at All Saints, the Choir provides structured after-school, weekend, and summer programming for urban boys and teenagers. In this safe, positive environment, boys engage in healthy activities alongside musical mentoring and tutelage. 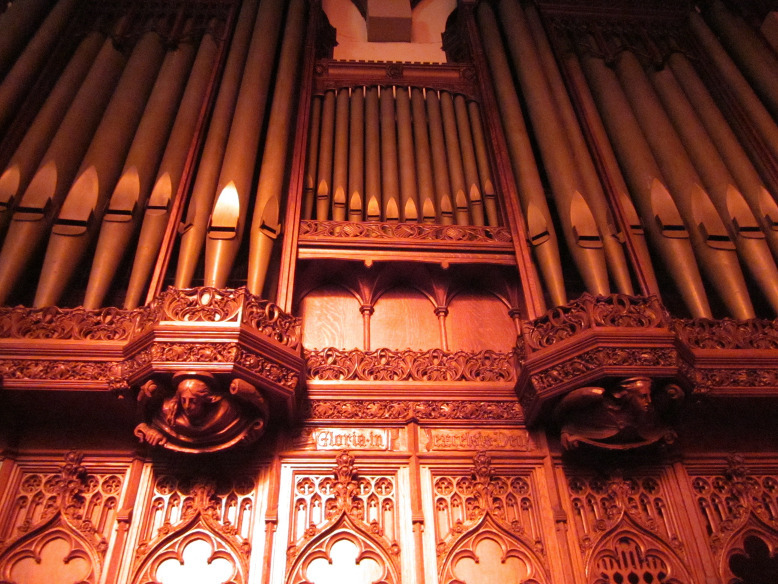 At All Saints, the Skinner will join the Centennial Organ, C.B. Fisk's Opus 103 of 1995, in the rear gallery. From this commanding position, the Fisk leads congregational singing and provides a thrilling instrument for solo literature. 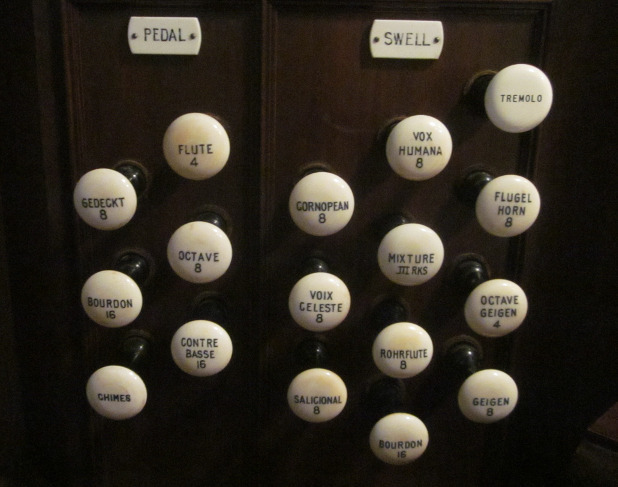 This two-organ arrangement finds a particular corollary to The Memorial Church at Harvard, whose 1930 Skinner serves Appleton Chapel for weekday worship, while the 2012 Fisk leads Sunday mornings and offers a superb recital venue. Arrived at Ashmont. On the left, the console is being gently rolled onto the van's lift. On the right, even the Rector is drafted as labor for this mostly volunteer effort. 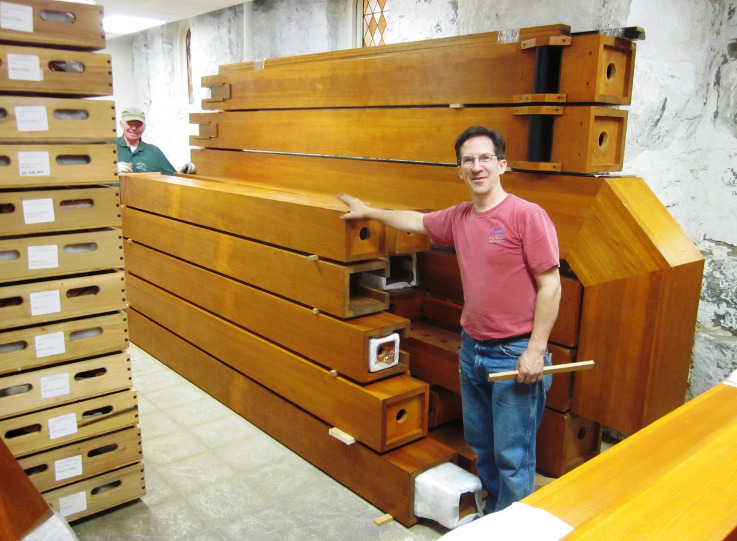 On the left, Joe Sloan poses with the disassembled Skinner organ at the north end of its undercroft storage room. On the right, the organ from the south end of the room. Last spring, the Joseph G. Bradley Foundation awarded All Saints a $55,000 one-to-one challenge grant to help close the remaining $110,000 gap to fully fund the Skinner project. In addition to the $465,000 already given towards the Skinner, All Saints has raised just over $20,000 towards the Bradley challenge. Therefore, every donation given at Prof. Porter's 21 September 2014 recital will be matched one-to-one by the Bradley Foundation, up to a total of $35,000. Chancel case work and non-speaking facade pipes. 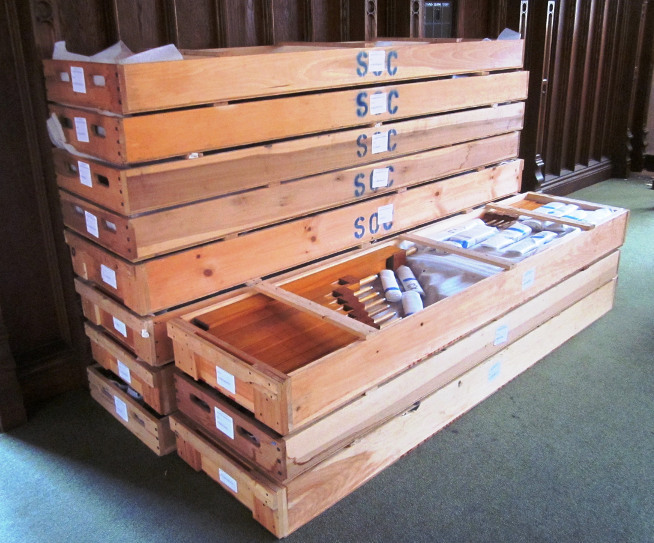 The Skinner organ will be installed in the organ chamber behind this case work on the project east side of the chancel. Phase II of the All Saints' building restoration is well underway and the project is headed toward completion in early Winter. Vaulted chancel ceiling depicting original square vent with rafter and new plywood blocking within the void. Notice the circular hole for the sprinkler head in the middle of the photo. The sprinkler head will be covered with a metal plate painted to match the wood ceiling. 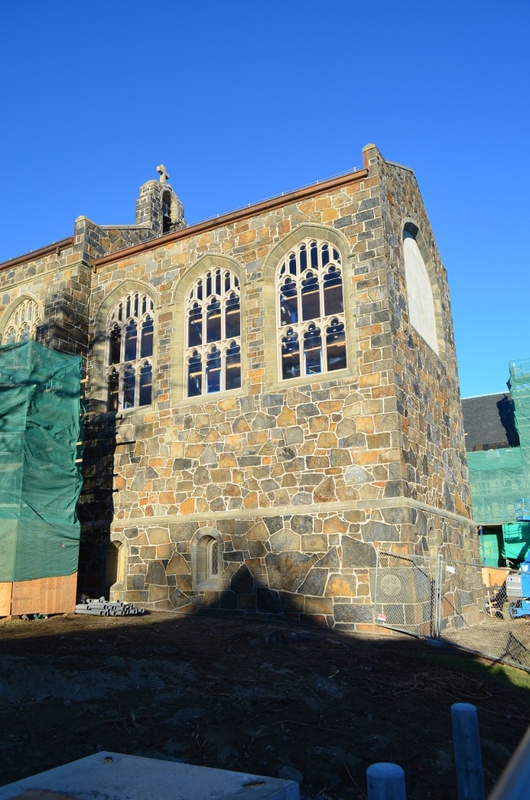 The focus of phase II is the construction of a small, two-story addition to the cloister wing and parish house to accommodate an elevator and a reconfigured stair hall. In addition this phase will see full fire protection extended to the church, and enhancements to the heating, electrical, and lighting systems in both the parish house and the church. The failing, 1980s, white laminate sacristy cabinets will be replaced with oak. This work in the sacristy will fulfill former rector Fr. Titus Oates's vision of a graciously sized and appointed sacristy to support the parish's worship. Two views of the void of the demoed stair hall. On the left facing north; on the right facing south. In the north view notice the arched sub-basement doorway in the lower left, the brick-arched doorway through the granite wall of the cloister wing into the first floor (Guild Hall) of the newer parish house, and the rising CMU elevator shaft. 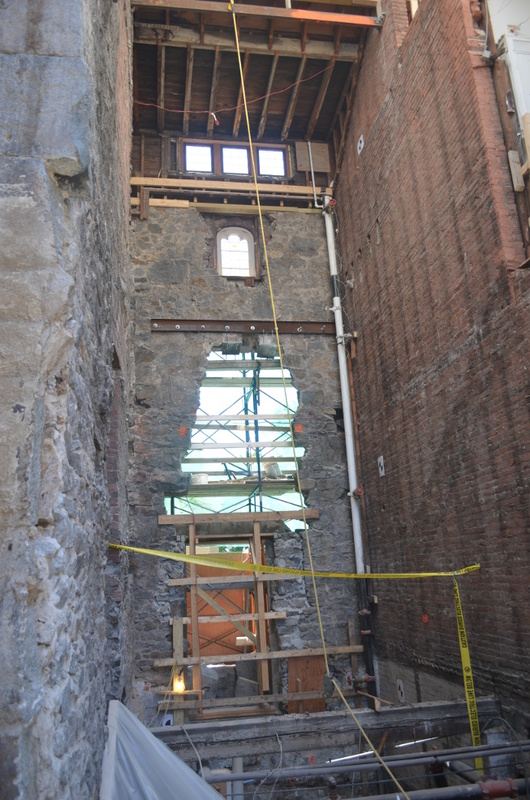 The south view shows the wooden-braced opening for the relocated door, the spanning granite lintel block in place. The new window for the Guild Hall landing will be at the top of the void in the granite wall. As of this writing, the excavation is completed, the foundation slabs and footings for the addition have been poured, and the concrete masonry unit (CMU) walls have been laid for the elevator shaft and the first floor. 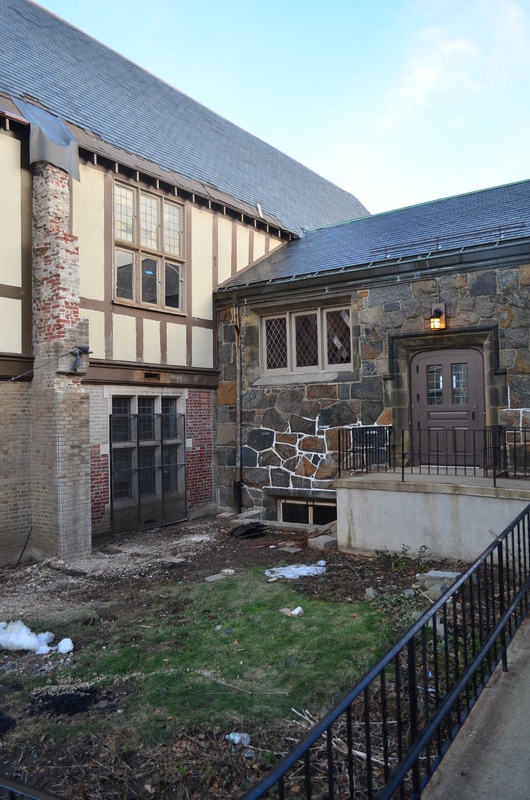 The old stair hall has been completely demolished and the Lombard Street door has been lowered by six feet and moved east by two feet to provide an accessible entrance to the parish house basement. The limestone surround for the new window at the Guild Hall landing has been installed. 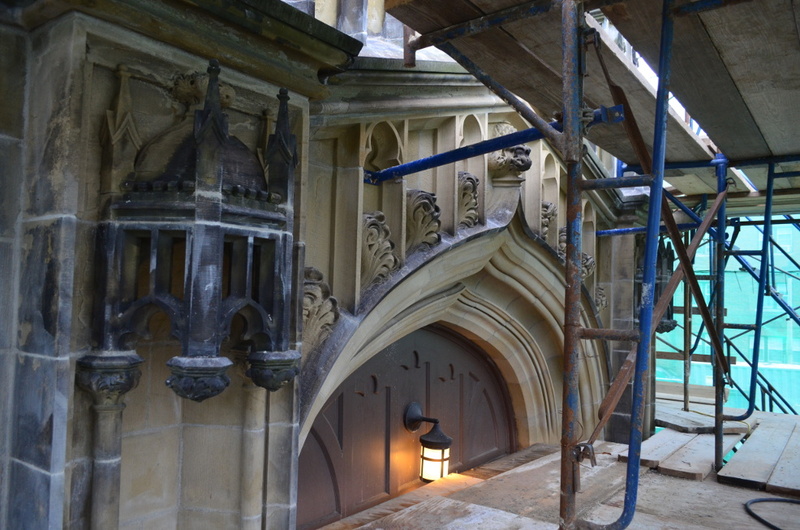 Taken two weeks later, the surround for the new window at the Guild Hall landing is largely in place, made from limestone salvaged from the window removed to make way for the elevator door at the first floor of the cloister hall. 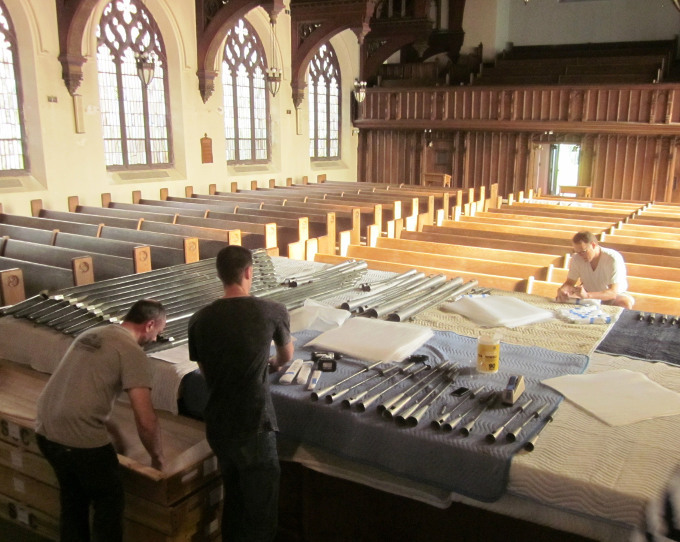 The electricians are roughing in the alarm portion of the fire protection system in the church and the sprinkler subcontractor is installing piping above the ceiling in the chancel. 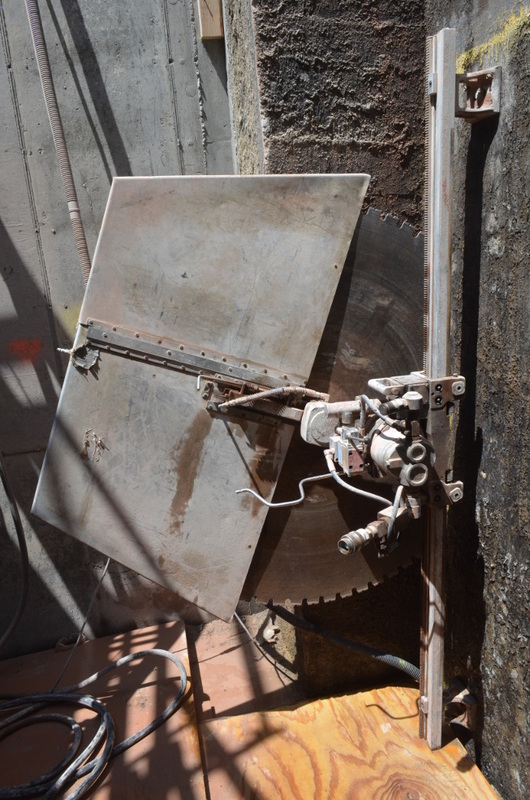 Fifty-four-inch saw mounted against the exterior of the east basement wall of the parish house. It is cutting the opening through which passengers of the wheel-chair lift will enter the gymnasium. 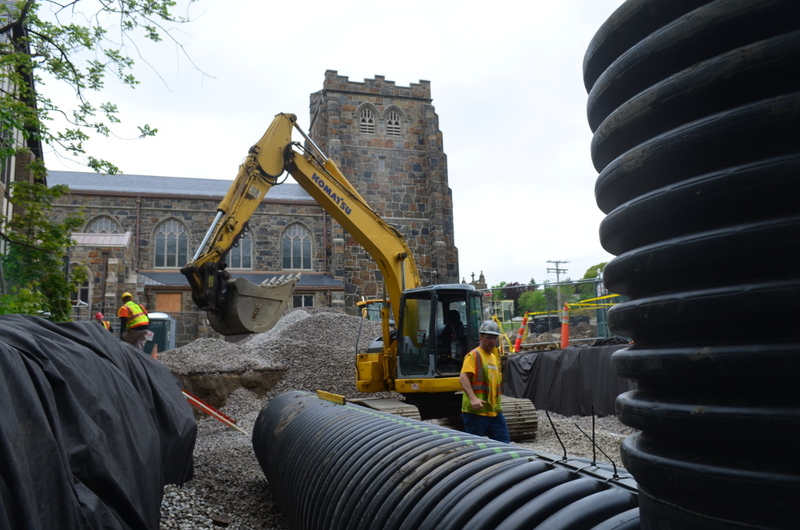 The site work subcontractor is connecting the rain leaders from church's restored roof and gutter systems to the new underground storm water retention structures. Cavalieri workers strap together a portion of the storm water retention system. A view of the nave and tower from the excavation for the retention sytem. 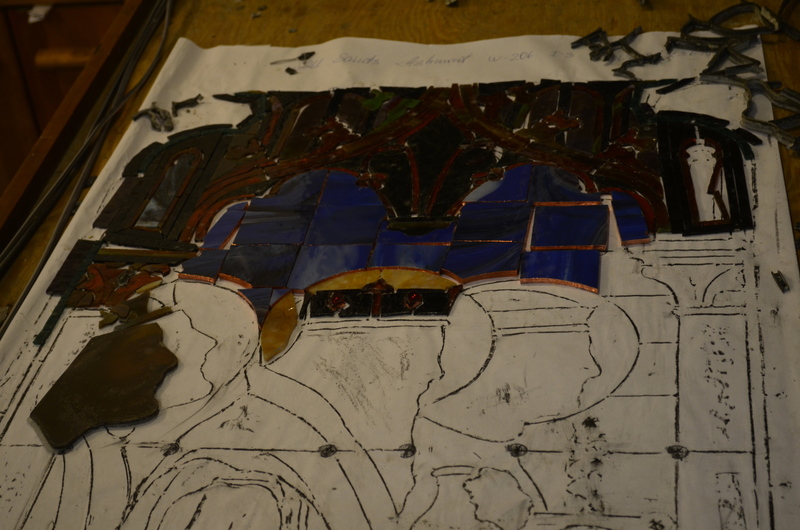 The Lyn Hovey Studio continues its restoration of the figural glass from the clerestory of the church and from the nave of the Lady Chapel. 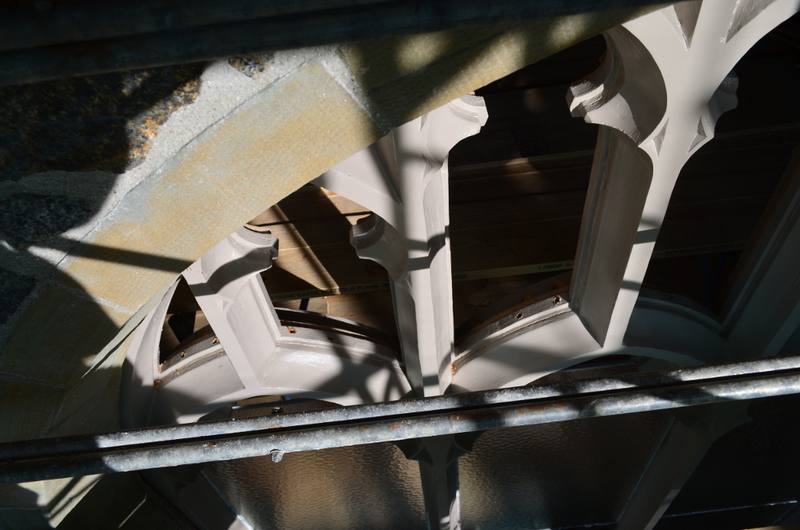 From the left to the right tray, a lancet from a window from the nave of the Lady Chapel (E106) is being releaded. The heating contractor is in the midst of replacing the aged steam boiler, distribution, and radiator systems with modern, redundant, hot water boilers, piping, and radiators. For a more thorough description of the work of both phases, see the update for mid-April. 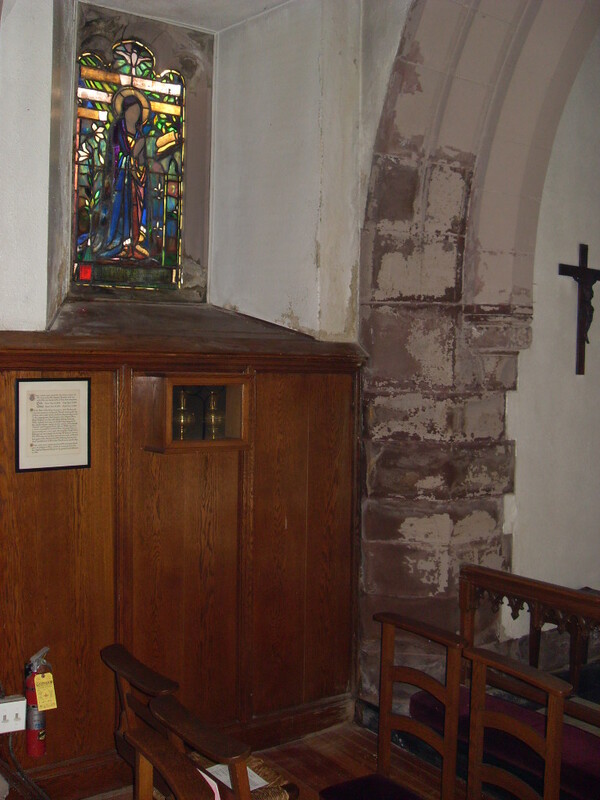 The work of restoring the fabric of the Parish of All Saints' was broken into roughly two parts so that the first phase could commence before design work for the second phase was complete. Phase I, which is largely complete, addressed the building envelope, including the roof systems, the masonry, and the windows. All Saints' tower from the NW in a noontime light in March. The tower is a memorial to Oliver White Peabody's brothers, Everett and William Bourn Oliver. Notice the crenelated roof of the circular stair at the right of the photograph. All of the slate on the chancel roof, the high roof of the nave, and the aisle roofs has been replaced. Spot repairs have been made to the slate of the parish house. 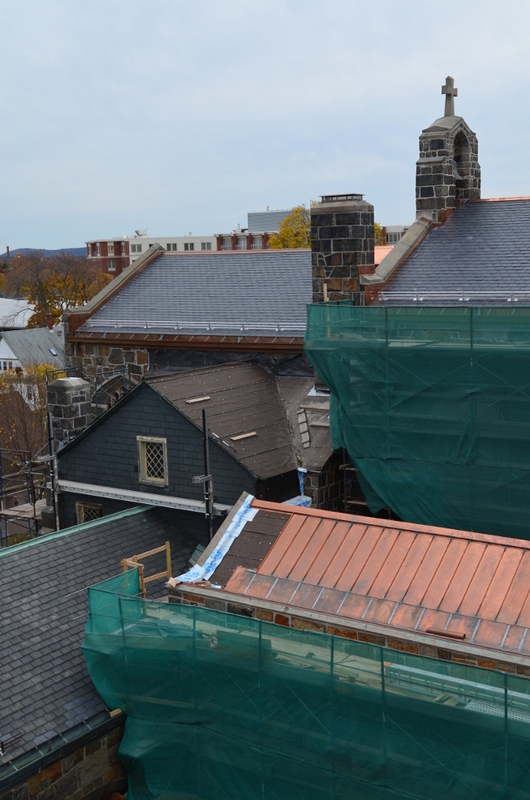 All of the copper work—standing- and flat-seamed roofs, gutters, rain leaders, buttress caps, roof ridges, and flashing—has been replaced. 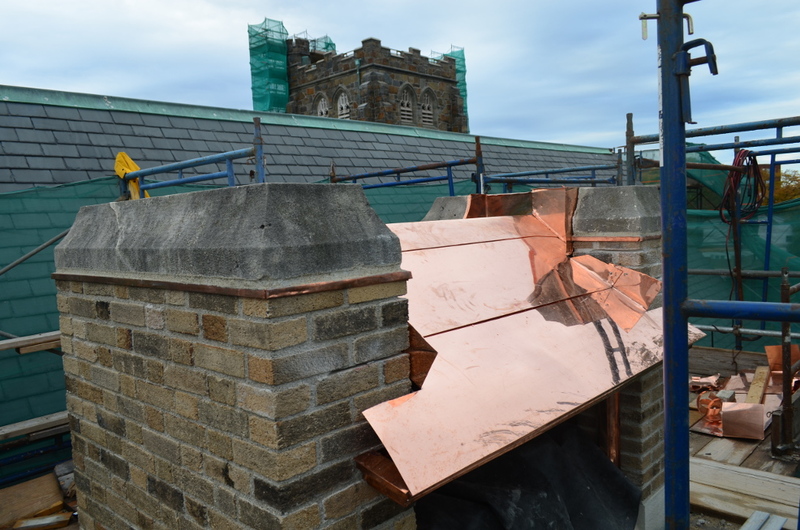 The completed sheet metal work at the roof of the stair to the All Saints' tower roof. 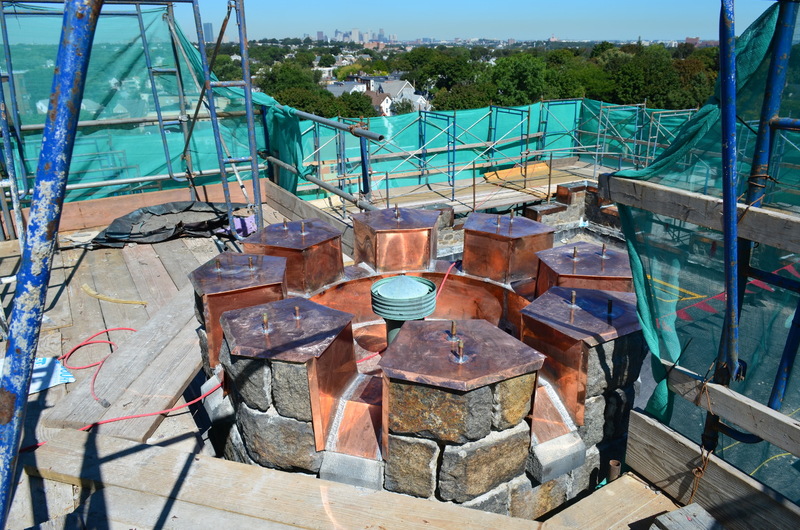 The coping stones have not yet been set onto their copper-sheathed pins. Notice the re-used original ventilation cover as well as the Boston skyline in the distance. The old mortar has been raked from between the Quincy granite blocks, but the new mortar has not yet been applied. 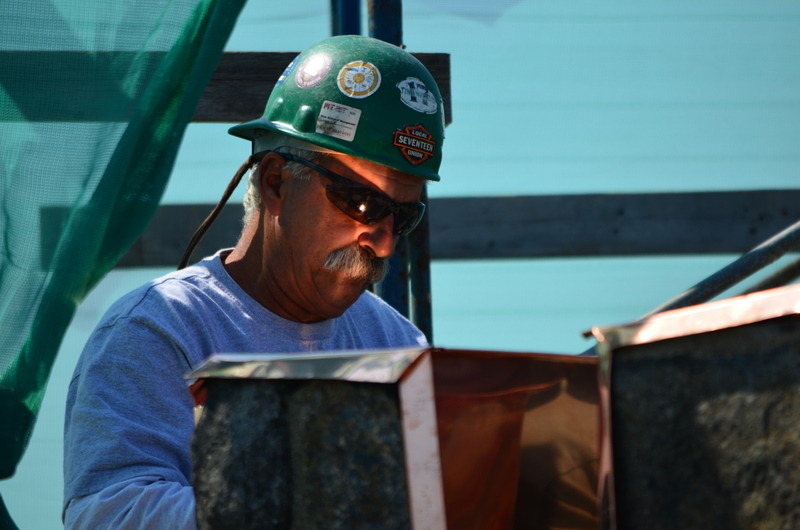 A Gilbert and Becker sheet-metal worker solders a join. In the photograph on the left, notice the hole in the masonry ready for the drain for this small, but complicated roof. The old mortar on this side has not yet been raked out. The photograph on the left shows four merlons flashed and four to go. On the right, the setting sun is reflected on the face of a worker as he cuts copper to fit against the four remaining merlons. The masonry of the entire church has been repointed and cleaned. Dutchman repairs have been made to a few selected portions of the sandstone trim. A gracious ADA-compliant ramp has been built from the West Door (geographic north) parallel to Ashmont Street, connecting to a walkway that runs south from the landing to the sidewalk grade. Two views of the northwest buttress on the narthex. The late afternoon image on the left shows the masonry before being raked and washed. The mid-afternoon image on the right shows the finished work with the new rain leader. A Consigli mason sizes a sandstone dutchman block to repair failed stone at an aisle window surround (W107). Notice the original horizontal hand-tooling. The photograph on the left shows the dutchman braced in place. 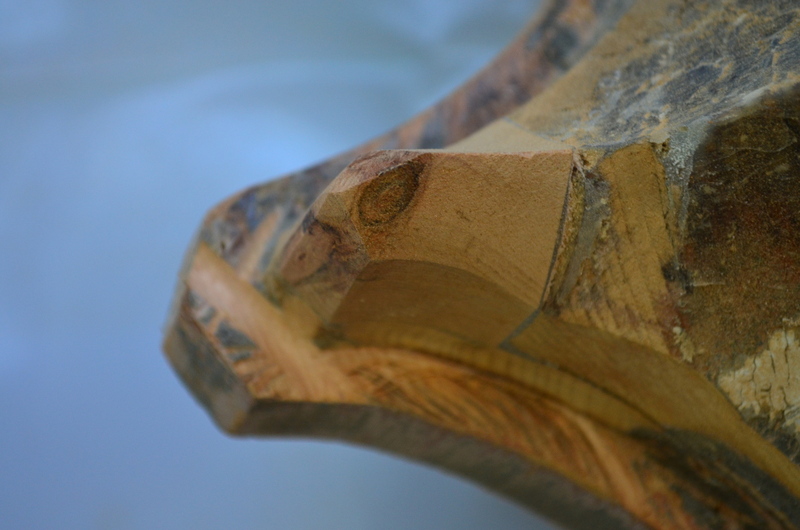 On the right, the repair before being trimmed and tooled to match the surrounding stone. Notice the failed gutter above the repair. Clerestory window W203 and aisle window W107 amidst the shadows of a dogwood and an orange 65-foot lift. Click (twice) on the photograph to see greater detail. The completed dutchman repair to the window surround of W107 can be seen at the upper right of the surround. The diamond quarry (also called, cathedral glass) in the church's clerestory—considered temporary glazing by the builders—has all been removed, unzipped, cleaned, releaded, and largely reinstalled. 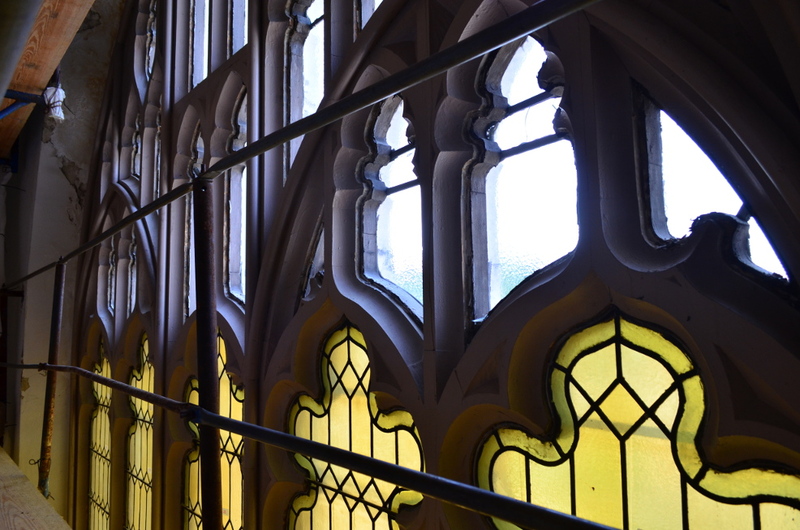 New protective glazing has been installed into tracery throughout the clerestory to replace the Lexan sheets that were placed over the tracery in the last third of the 20th century. 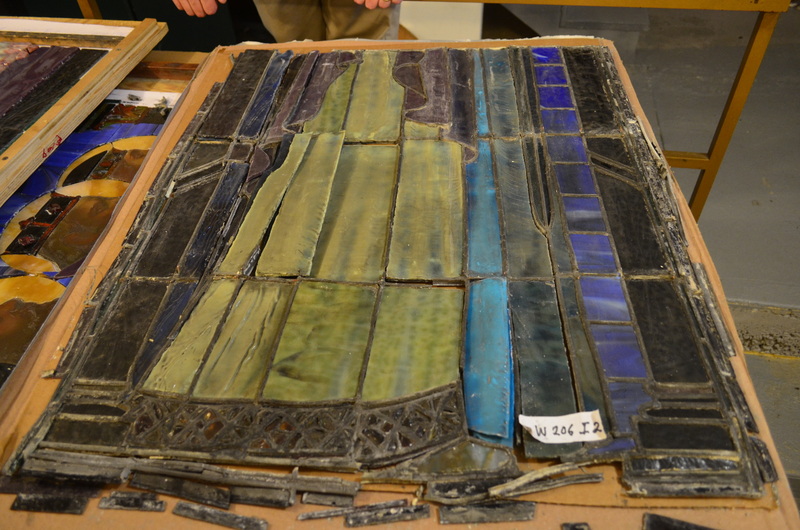 The figural glass in the aisle windows has removed and restored like the clerestory cathedral glass, with the addition that broken pieces that cannot be mended have been replaced with newly painted glass. 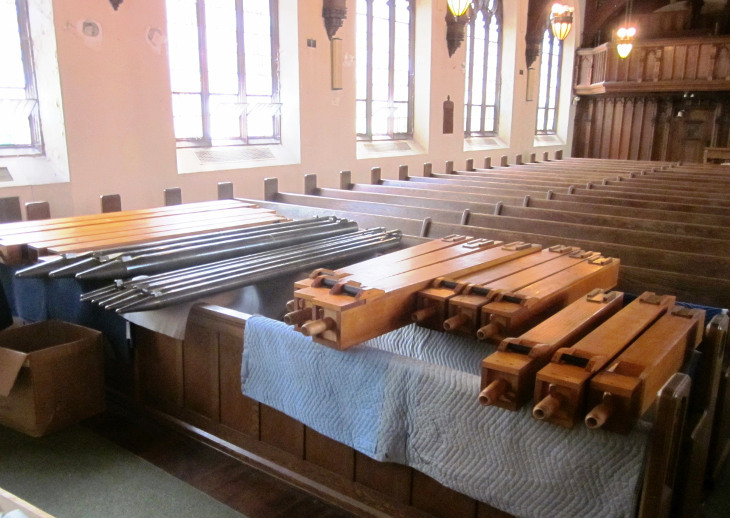 The frames for all the windows in the church have been repaired. 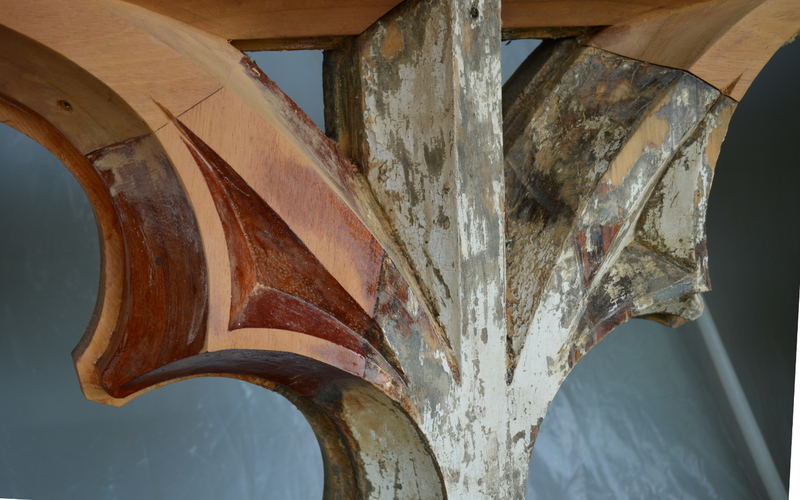 The tracery for the clerestory was in terrible condition and has been fully restored using like-species dutchman repairs where possible and Honduran mahogany where complete members required replacement. 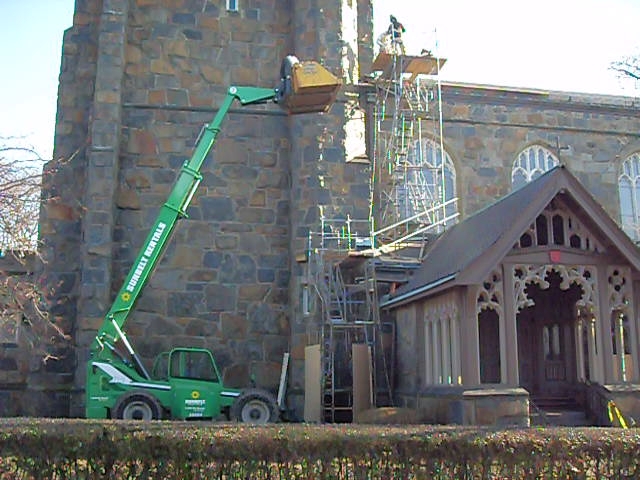 The final caulking and painting of the tracery awaits warm spring weather. 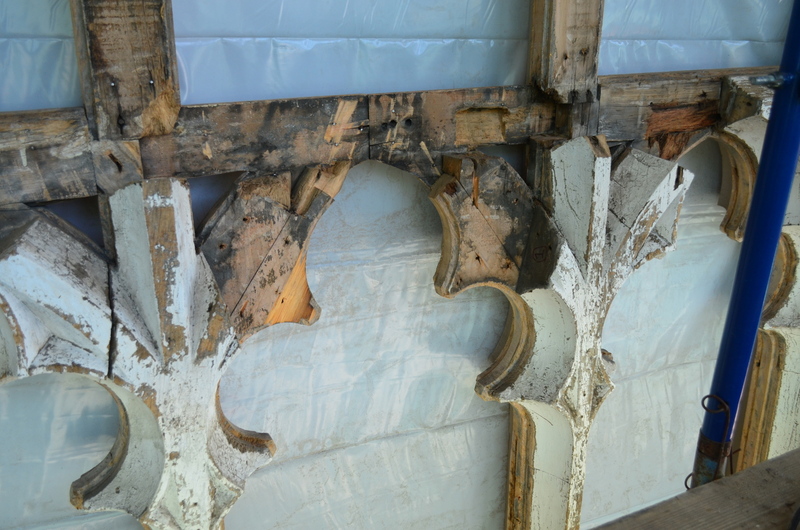 Two views of clerestory tracery prepped for repair. See here for additional photos. The photograph on the left shows a rough block of old-growth white pine ready to be fashioned. On the right, a Consigli carpenter chisels that block into shape. Two views of the repaired nose. 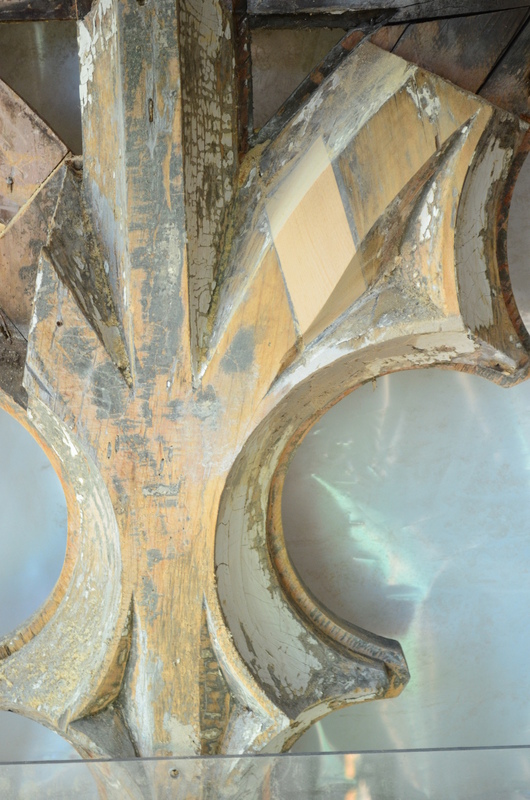 Two views of mahogany replacement members in the clerestory tracery. Close-up of another like-species dutchman repair on the left. On the right, a close-up of plastic repair at the head of a lancet. 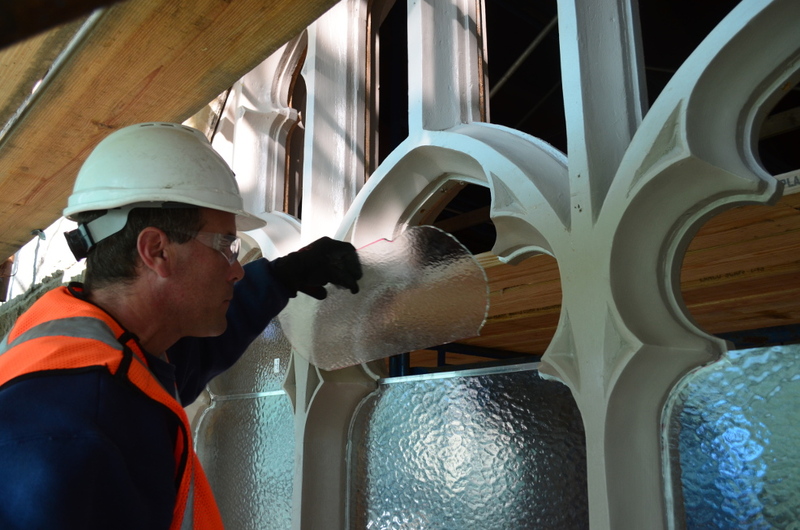 Inspecting clerestory tracery after painting and prior to installation of protective glazing. 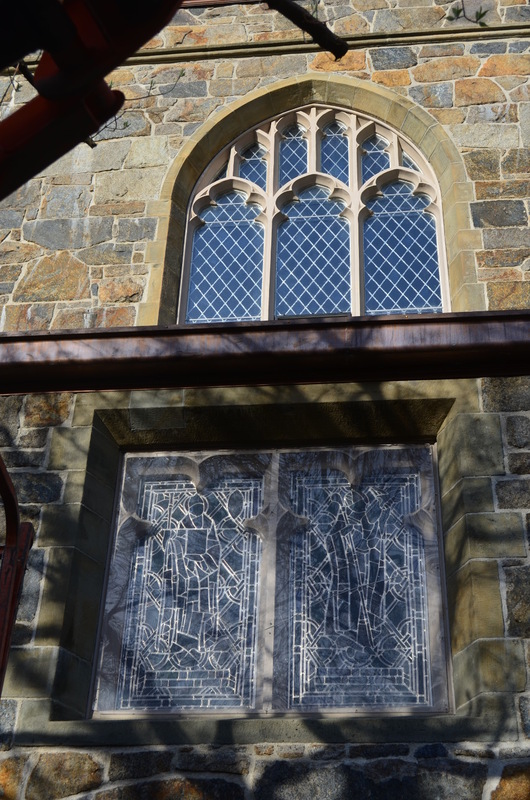 All of the leaded glass windows have been rebuilt for the parish house and in the hyphen connecting the parish house to the church (termed the cloister hall by generations of parishioners). Their installation also awaits warmer weather. 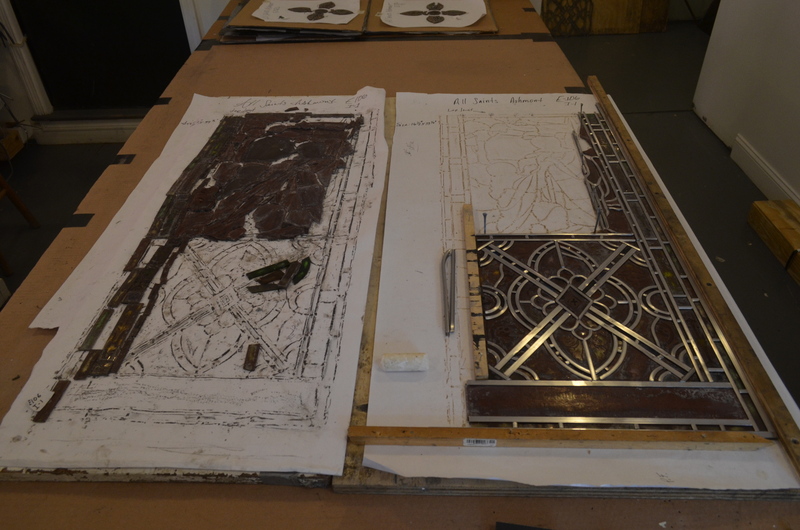 The leaded glass was manufactured by the Lyn Hovey Studio in Guatemala. All of the wooden window frames have either been restored or rebuilt. The metal casement frame have all been restored. New bathrooms in the parish house for women (five stalls) and men (three stalls) have been installed in the former nursery room, while a new nursery room has been constructed in the former locker room. A new code-compliant stair to the gymnasium replaces the old stair. The work currently ongoing belongs predominately to phase II. This work consists of construction of an addition for an elevator, site work, refurbishment of the heating system, extension of the sprinkler pipe system to the church, and additional interior restoration. The five principal public floors floor of the parish are divided between the church and cloister wing (two floors) and the parish house (three floors). When we built the parish house in 1907, we insisted on providing as much space as possible on the land available, without overshadowing the church. So, we excavated as deep as possible and built a three floor building (basement and two upper floors), with a gymnasium sunk an additional half-floor below the basement. With so many floors in the parish house, it was not possible to align these floors with the existing levels of the church and cloister wing, necessitating a clever, but awkward, counterclockwise stair. This capacious stair hall fulfilled its function by forcing its users to go down a half-flight from the first floor Guild Hall before ascending two flights to the second floor Peabody Hall. 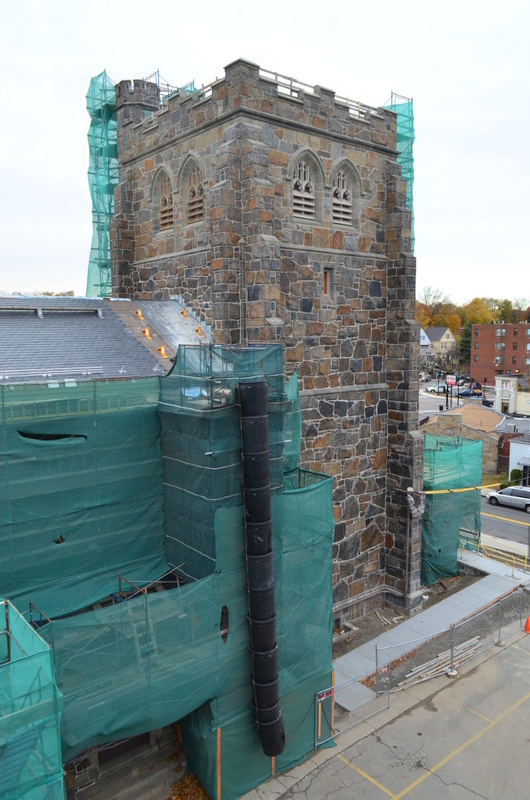 To provide accessible access to each of the public levels of the church buildings, an elevator with new lobbies for the parish house floors will be installed in a modest seventeen-by-twenty-foot addition being built at the juncture of the parish house and the cloister wing. This addition will provide a gracious new vestibule and entrance to the parish buildings, housing a five-stop elevator, a wheelchair lift from the parish house basement to the gymnasium, and lobbies. The former main entrance to the parish house into the fire stair at the northwest corner will return to its original function as a fire exit. A reconfigured, and smaller, clockwise stair hall will replace the original, awkward stair hall. This new stair hall will fulfill better its function as a fire block between the floors of the two buildings it connects. In addition the entrance from Lombard Street will be lowered to sidewalk grade to enter into the basement level of the parish house. It currently enters the old stair hall at an odd, half-flight level between parish house floors. 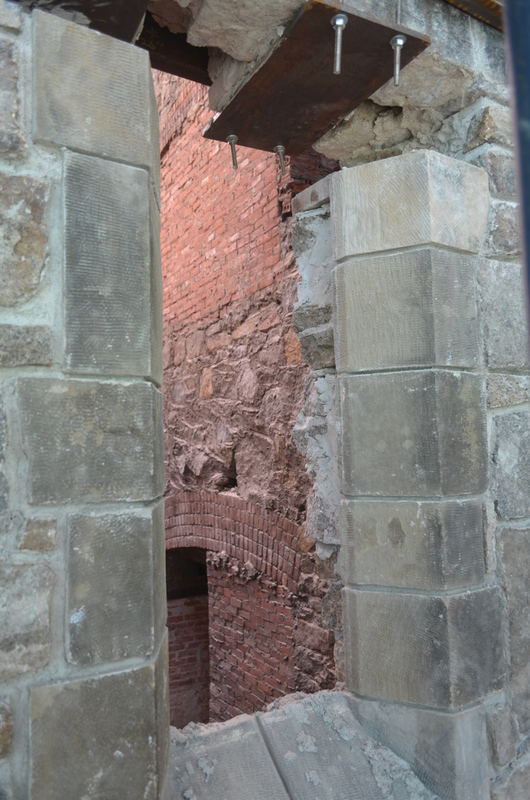 Other dramatic changes to the masonry of the cloister wing will be the removal of two windows and one exterior door, all three of which be inside the new addition. The exterior door will be replaced with a door into the elevator at the church level. The windows will make way for passages from elevator lobbies. 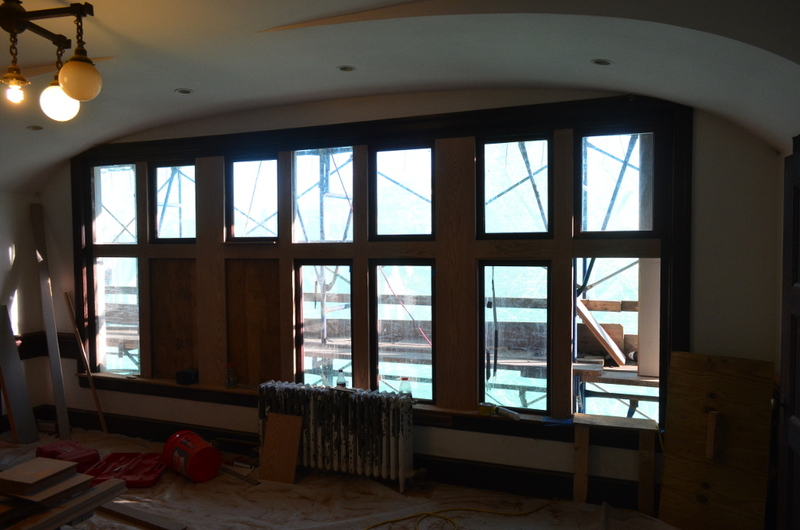 Two sets of windows in the parish house will make way for doorways from elevator lobbies into the Guild Hall (lower hall) and into Peabody Hall. We are grateful to our architects, John G. Waite Associates of Albany, New York, for their diligent efforts to resolve the tension between accommodating the desired accessible access to the public floors of our well-used buildings and the need to provide an architecturally sensitive addition that respects Ralph Adams Cram's vision for his first and influential ecclesiastical commission. We started the design process at A and were finally happy when we arrived, twenty or so iterations later, at the design labeled T.
The photograph on the left shows a yellow-hatted, six-foot-tall architect at the bottom of the excavation for the elevator. On the right, Matt Scheidt, in the foreground, takes a photograph of three members of the building committee who stand in front of the tower. Photos before the excavation may be seen here. 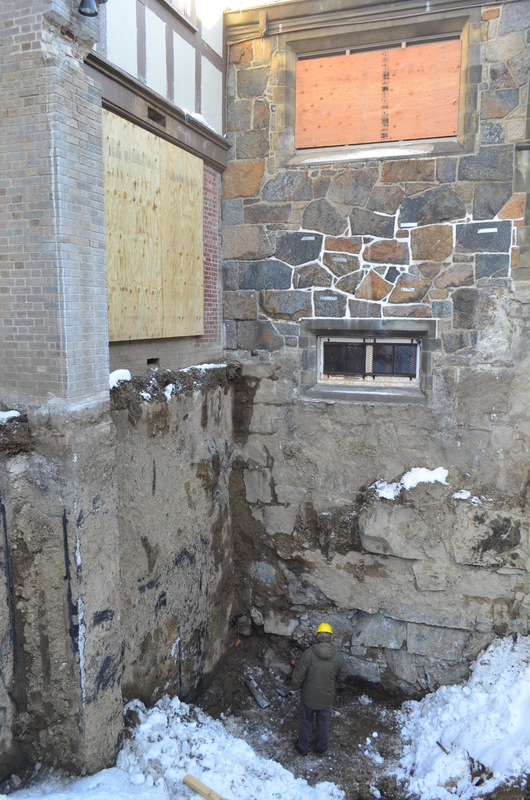 The excavation for the addition extends via a trench box another ten feet deeper than the two excavation photographs above. The red ladder descends into the blue trench box for the steelworkers to set the rebar for the slab and footings for the wheel-chair lift to the gymnasium. The excavation and site work required to realize this design is simpler to explain. A pit between the parish house and the Lady Chapel was excavated beneath the level of the gymnasium, using a trench box set against the parish house foundation. A concrete slab and foundation for the wheelchair lift from the basement level down to the gymnasium was poured. That trench box was removed and a second trench box was set against the foundation of the cloister wing at a slightly higher level. The slab and foundation for the elevator were then poured. 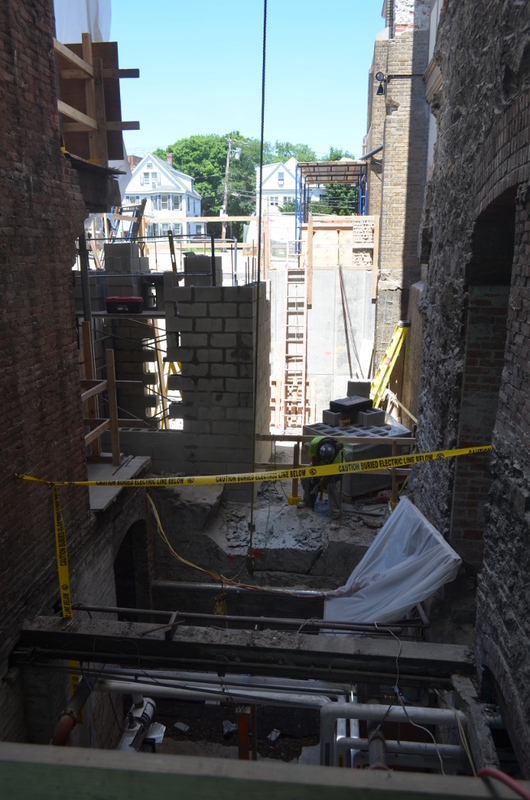 After back filling against these foundations, a third slab and foundation will be poured north of the location of the elevator for the first floor lobby and vestibule. CMU walls (concrete masonry unit) will be erected for the elevator shaft and the addition's exterior. The addition will match in style the parish house, being sheathed in brick at the first story and stucco and half-timbering at the second story, employing limestone window surrounds salvaged from the obscured east wall of the parish house. 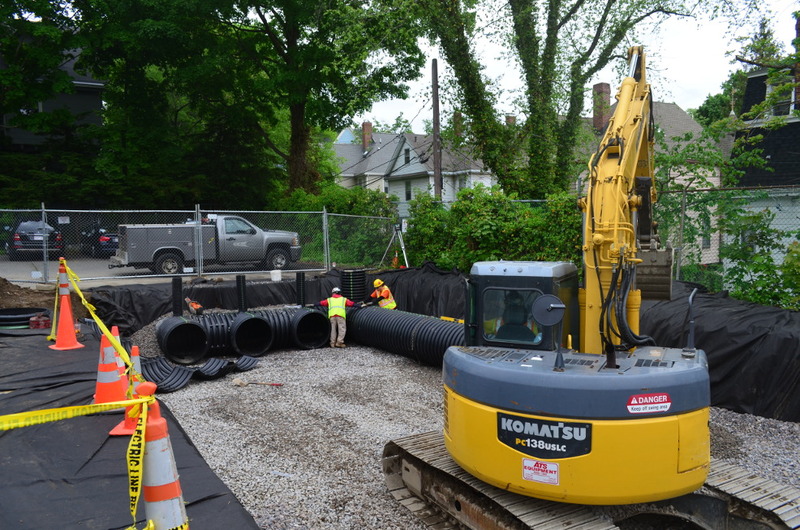 Other site work, now nearing completion is the installation of a groundwater recharging system to capture storm water from the roofs and the parking lot and to funnel it to retention structures. 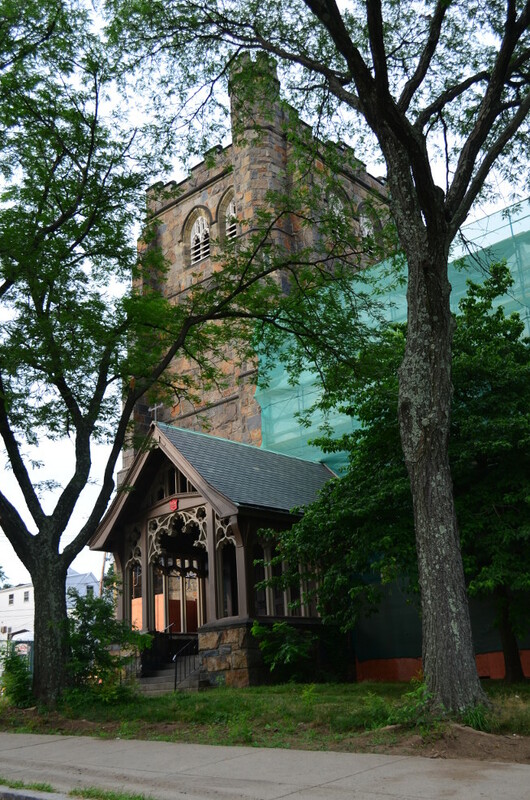 One structure, located west of the church along Bushnell Street will accept storm water from the west-sloping roofs of the nave and chancel. The second structure, just north of the parish house will receive storm water from the east elevation of the church, tower, and parking lot. The third, linked set of structures will receive storm water from the parish house and cloister wing roofs. Near the end of the project, the parking lot will be reconfigured for three more parking spaces and sidewalks will be laid to provide a gracious walk from a drop-off area into the vestibule of the new addition. The current oil-fired, hybrid, steam/forced-hot-air heating system will be replaced with a gas-fired, hybrid, hot-water/forced-hot-air system. Where there are steam radiators, they will be replaced with hot-water radiators. 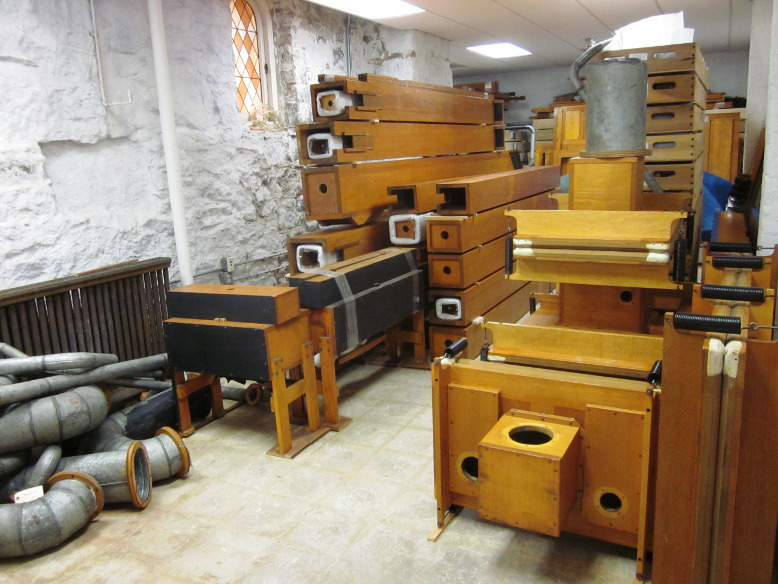 The existing forced-hot-air ducts beneath the church will be cleaned and retained, but the steam radiators over which air is forced to heat the church will be replaced with hot-water radiators. The offices will be supplied with air conditioning. The plaster of the interior of the church will be repaired. 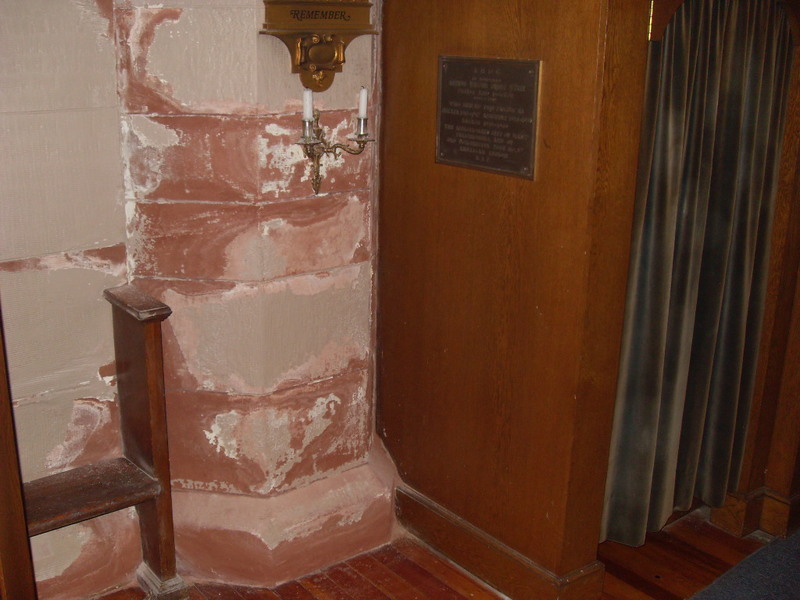 The painted stone surfaces throughout the church, chapels, and tower will be stripped of their damaging paint and restored to their original reddish appearance. The historic lighting fixtures will be rewired and restored (in this fourth lighting renovation) to their original appearance, with the removal of the unfortunate "dunce caps" that were added to them during their third renovation. 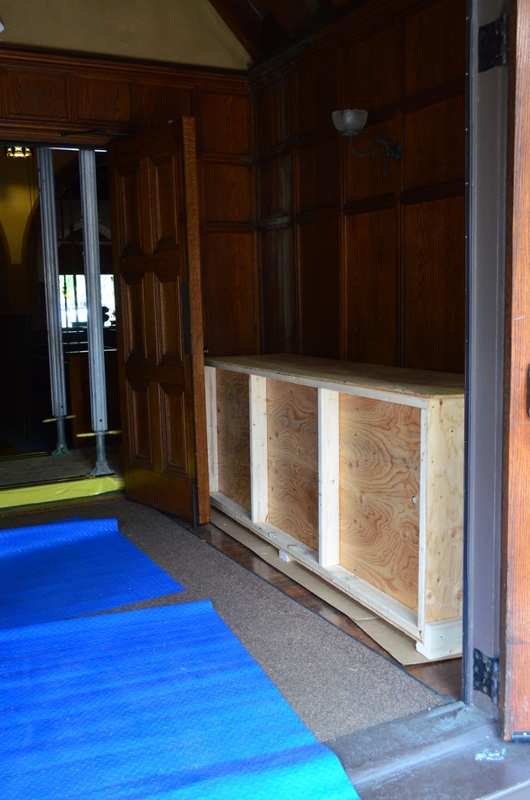 The sacristy will be completely renovated with oak cabinetry. Finishes in Peabody Hall will be refurbished and new tables and chair supplied. 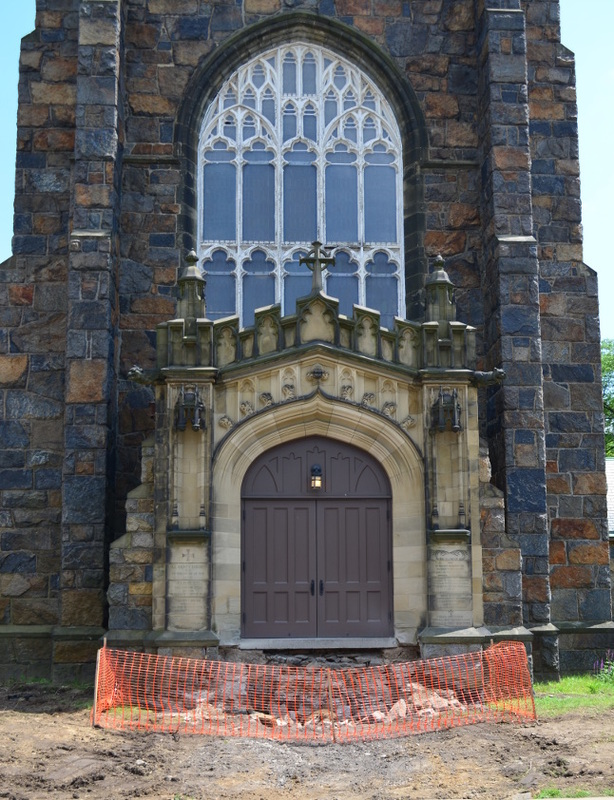 Each week a short update is printed in the Sunday bulletin so that parishioners are apprised of the status of the building restoration work, what has been finished in the preceding week, what is still in progress, and what to expect in the coming week. Phase I of the restoration largely deals with the building envelope—masonry, roofs, windows—and it is approaching substantial completion. 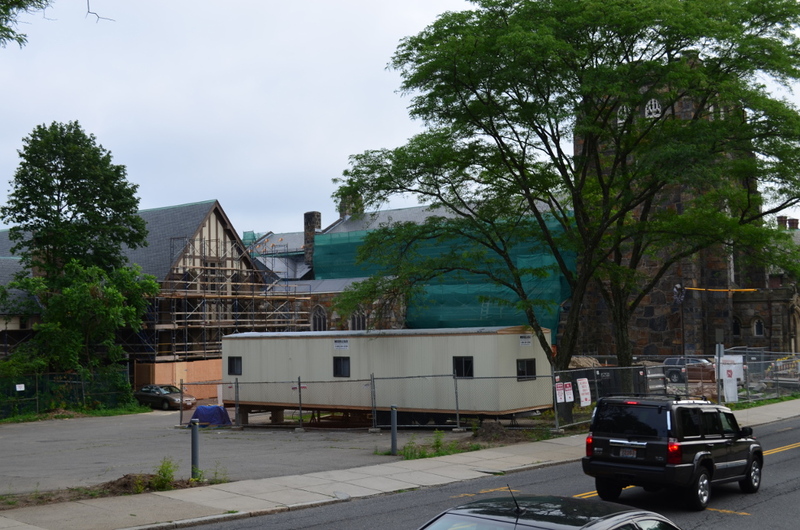 The centerpiece of Phase II will involve the demolition of the stair hall that connects the church to the parish house and the provision of a new stair hall and an elevator. Here is the text of the Restoration Update that appeared in the bulletin for Sunday, 12 January 2014. Staging remains only at the Lady Chapel, with a small tower on the south side of the cloister and a couple of frames around the Bushnell Street porch. With the staging down everywhere else, we can see the fine work that our masons, carpenters, roofers, glaziers, and other trades have done. 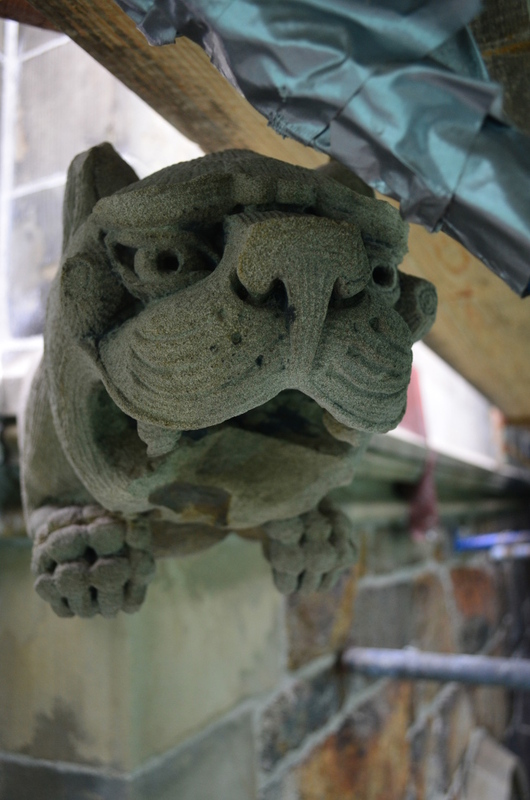 Despite the cold and snow, dogged worked continues to finish the metal work and slating at the roofs of the aisles, the west porch, the organ chamber, and the Lady Chapel. Three of the four clerestory windows in the chancel are fully installed (except for the ventilator sash), and the fourth is well on its way to completion. Power will be out in the Parish House during the day, Monday, 13 January. 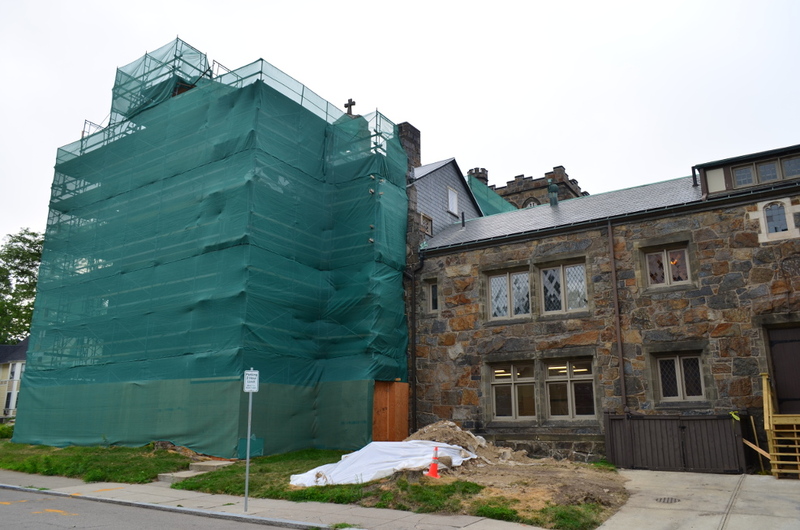 Now that the scaffolding around the parish house is entirely down, it is possible to begin to imagine the changes in store. The finish carpentry restoring the interior of the truss repairs looks original. 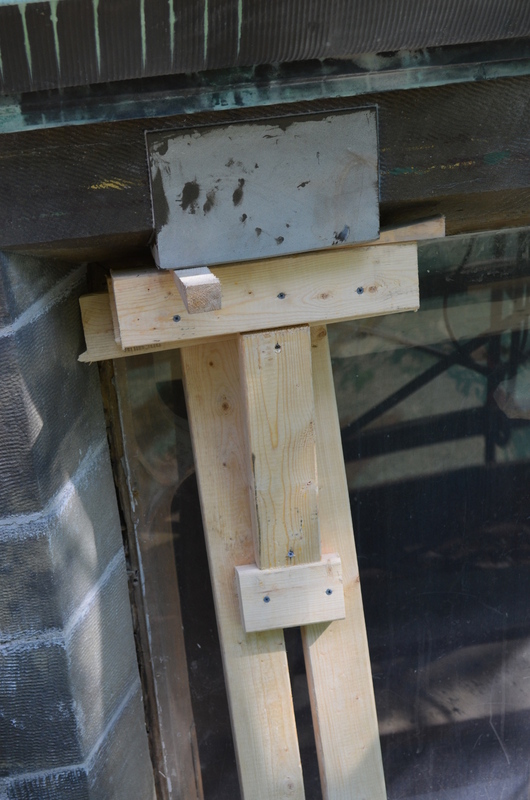 The window frames, wood and metal, are all replaced and painted. Some leaded sash have been installed—and they look especially fine, with their polished brass hardware—but the bulk of them will be installed when the weather breaks in the spring. New entrance vestibule and elevator will be housed in an 20x17-foot addition to be built here. The big changes will begin in two to three weeks. Stand—while you still can—at the top of the 1980s handicap ramp to the cloister door and look east at the parish house. You will see two unrepaired windows, a parish house buttress stripped of its veneer brick, unfinished slating at the roof line, and, flanking the first floor window, two extents of temporary brickwork. It is here that the new construction of an elevator addition will occur. Say goodbye to these windows, to the two adjacent windows on the cloister (first floor and basement), and bid fond adieu to the cloister door. 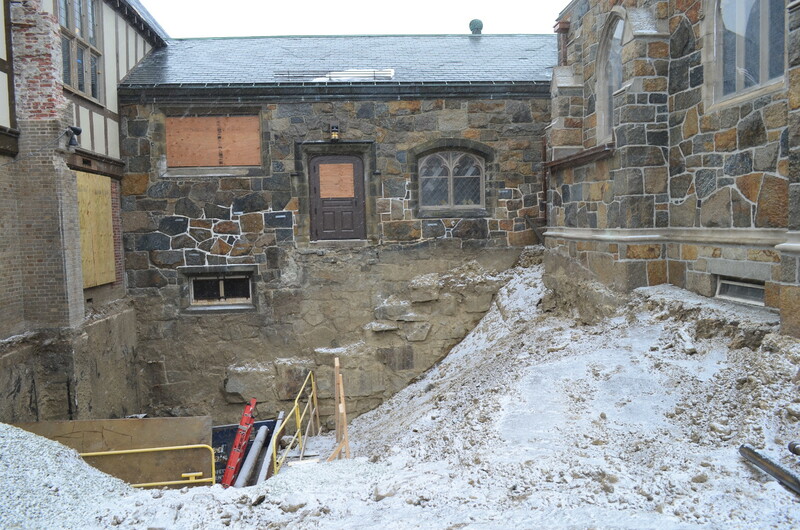 Soon a twenty-foot-deep hole will be dug between the parish house and the Lady Chapel, ramping up forty feet from the cloister out into the parking lot (a 2:1 grade). Once the deep footings for the elevator and addition have been framed and poured, our construction managers will supervise the demolition these parts of the walls of the cloister and parish house and the masonry work to accommodate a 20 by 17-foot, two-story addition housing a fine new entrance vestibule and an elevator and its lobby. The five-stop, two-door elevator will provide full access to all the main public levels of the church complex. 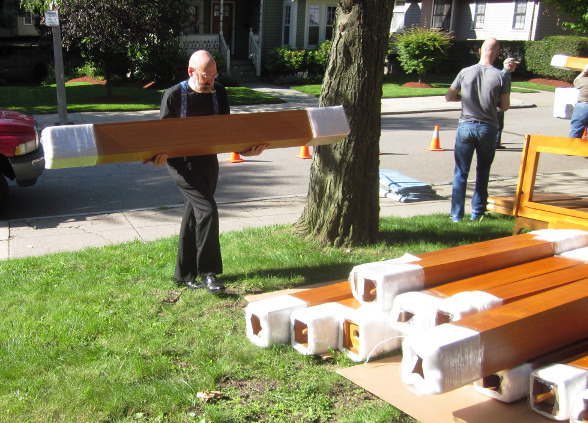 This work, stretching over much of 2014, will also require the demolition of the old stair hall connecting the choir room, both floors of the parish house, and the church. For most of this time access to the parish house from the church will require going outside and entering the parish house from the office entrance. Access between the first and second floor of the parish house will be only by the metal staircase at the north end of the parish house. We will have access from the church to the lady's restroom for some of this time, but very soon the gentlemen will begin using portable restrooms located outside the parish house. 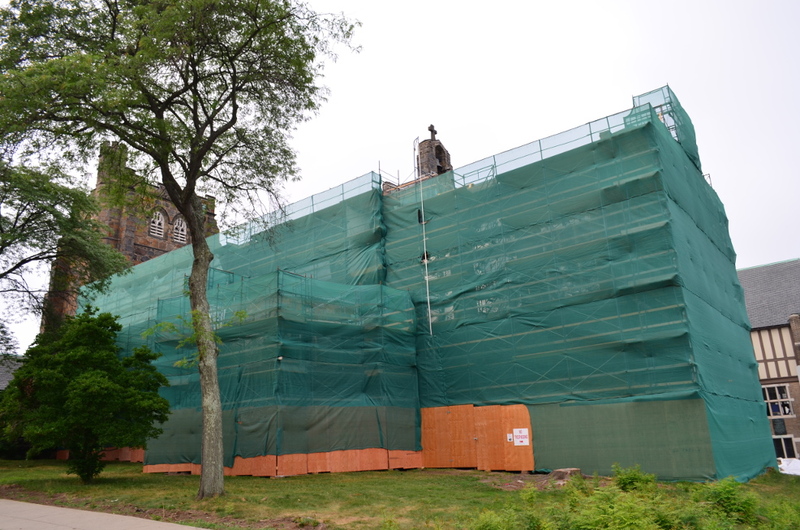 All of this work—elevator and new stair hall—will come to completion toward the end of 2014. The massive granite blocks of the All Saints' bell tower give an appearance of agelessness and permanency. It can seem as though the church will always stand ready to receive us in the time of our spiritual need, when we baptize a child, when we take a spouse, at the time of our funeral mass, and Sunday by Sunday throughout our lives. Yet, each generation must make its contribution to maintaining and improving this great material witness to the Christian Faith. By means of a providential, anonymous gift and through the efforts and gifts of many parishioners and friends, today's generation is making its own contribution. Newly repointed bell tower from the southeast. The tracery on the south face of the tower has been stripped of old paint, while that on the east face (on the right) shows the final window tracery color. Notice the electrical service entrance cable sheathed in yellow against the green scrim in the lower right. The parish is in the midst of renewing and improving the parish fabric and almost every aspect of the building is being addressed. The All Saints' building restoration is broken roughly into two phases, one focused on the building envelope and a second, overlapping phase focused primarily on interior work. With the favorably warm and dry autumn weather, work on the first phase is rapidly drawing to completion as the construction season also draws to a close. The east face of the chancel in afternoon light, with the downspouts yet to be installed. 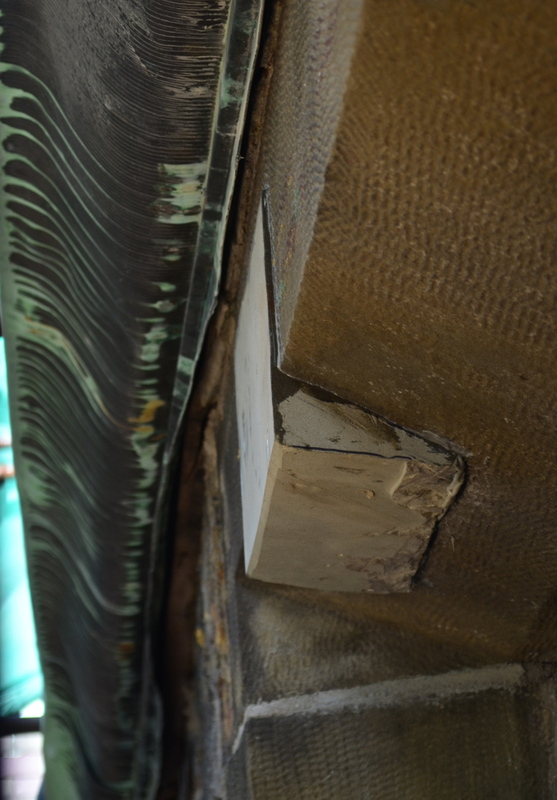 The wooden planking of the interior scaffolding can be see through the permanent protective glazing. 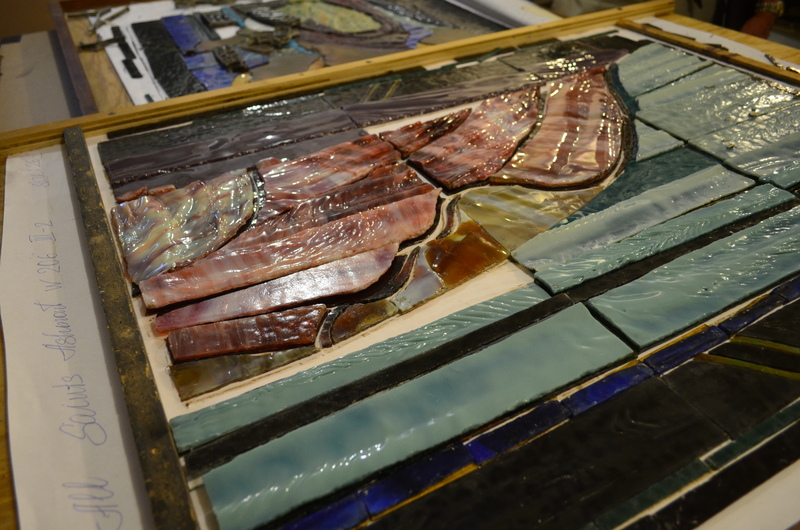 The rose-colored, diamond quarry, stained glass will be reinstalled later in the project. 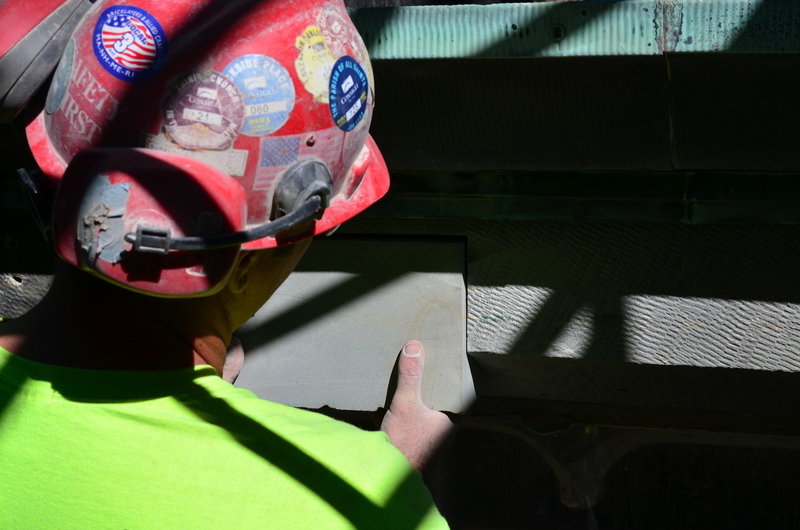 The envelope of our buildings consists of a variety of roofs, a large amount of granite and brick masonry, and windows almost too numerous to count. 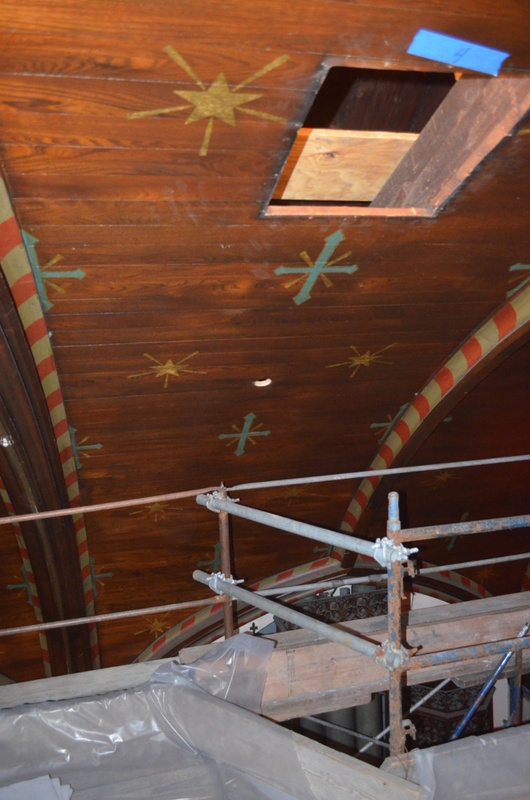 The nave and chancel roofs have been completely reslated with all new gutters, down spouts, flashing, and snow fencing. The two aisle roofs will be reslated shortly. 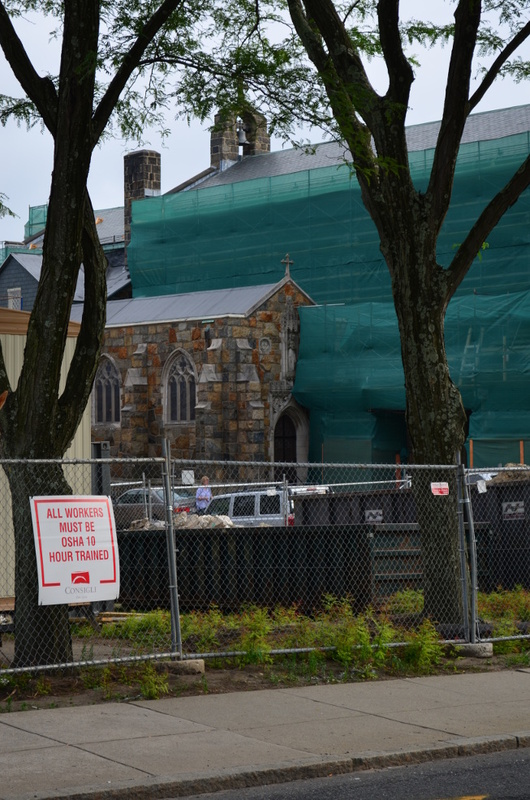 There will soon be four new double-lock, sheet metal roofs—flat seamed for the bell tower, narthex, and St. Stephen Chapel and standing seam for the Lady Chapel. All this work is augmented by the numerous crickets, roof ridges, wall through- and step-flashing. With only the clear protective glazing in place, the chancel is as brightly lighted as a gymnasium until the rose-colored clerestory windows are restored. The scaffolding will be used for the installation of code-required sprinkler piping. 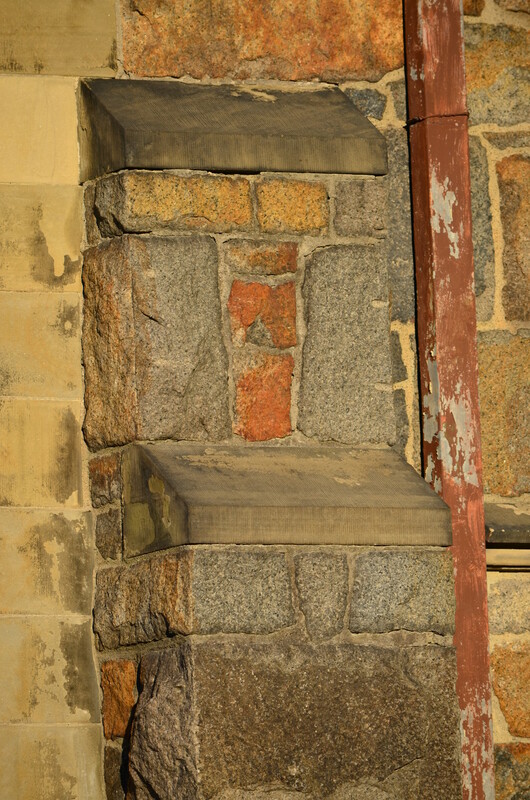 Constructed of local, Quincy, seam-face granite, the entire church and connector to the parish house have been gently washed, the mortar chiseled out, new mortar laid in, and the stone washed again. 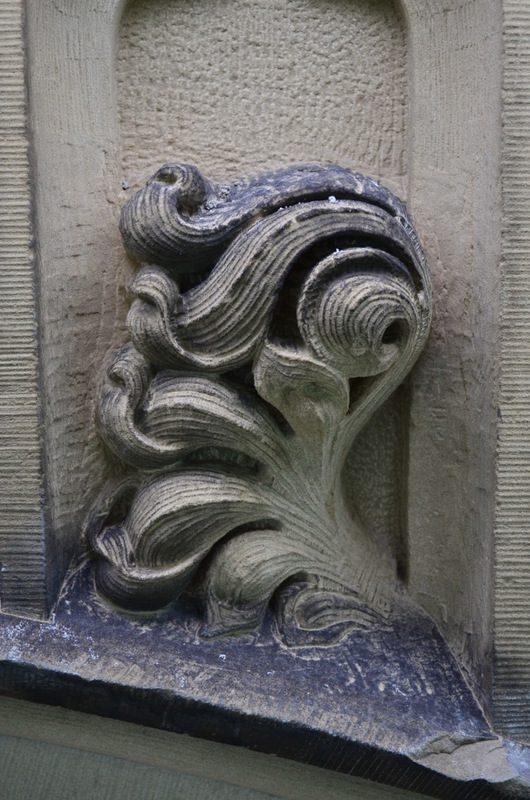 Special attention has been paid to gently wash the years of pollution and grime from the Nova Scotia and Indiana limestone used for detailing at the narthex, window surrounds, and string courses. The original mortar was tested and compared to the 1892 building specifications and a historically accurate and durable match was devised as to composition, aggregate content, and color. A view of five of All Saints' many roofs. Counter-clockwise from the upper right are: the slate high roofs of the nave and chancel, the unfinished roof of the organ chamber with its cricket to the right, the untouched slate roof of the cloister wing, and the partially finished Lady Chapel roof in double-lock, standing seam sheet metal. 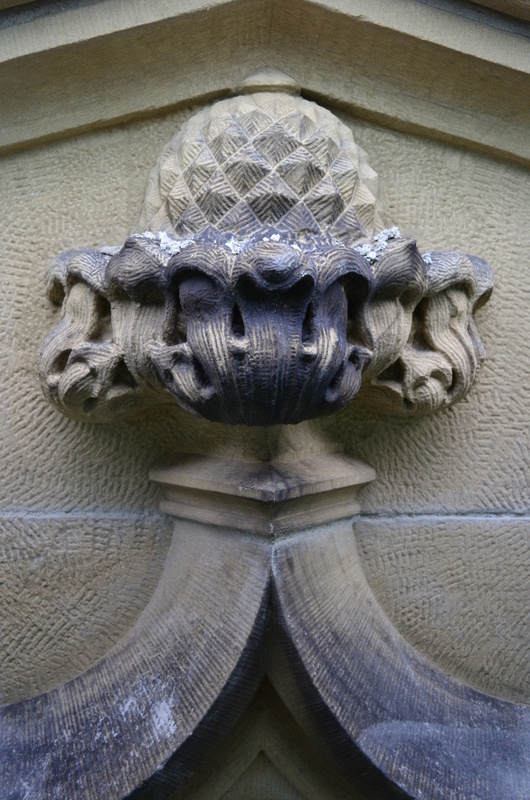 The expert masons laid the mortar into the joints with care to maintain a slight relief to the face of the stone. Thirty-five tons of mortar were removed from the building and 35 tons of new mortar were applied into 46 thousand linear feet of joints. 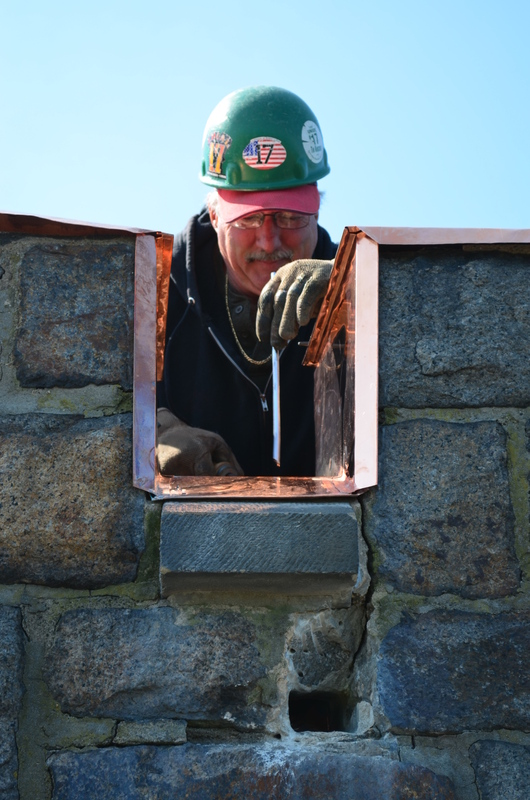 The coping stones at the chancel roof and at the bell tower were taken down and remounted with stainless steel pins to anchor them more securely to the building. 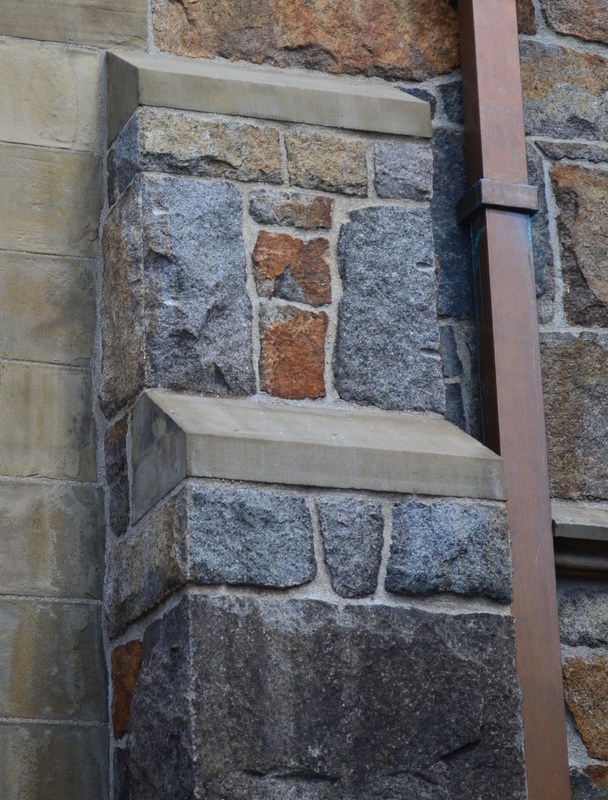 In addition, seismic brackets now brace the parapet walls of the bell tower. Two buttresses of the parish house. The buttress to the left has been rebuilt and reflashed to prevent the water infiltration caused by the original design. The buttress on the right, draped with a temporary sheet, has had its wooden truss end repaired and will shortly have its brick veneer rebuilt. 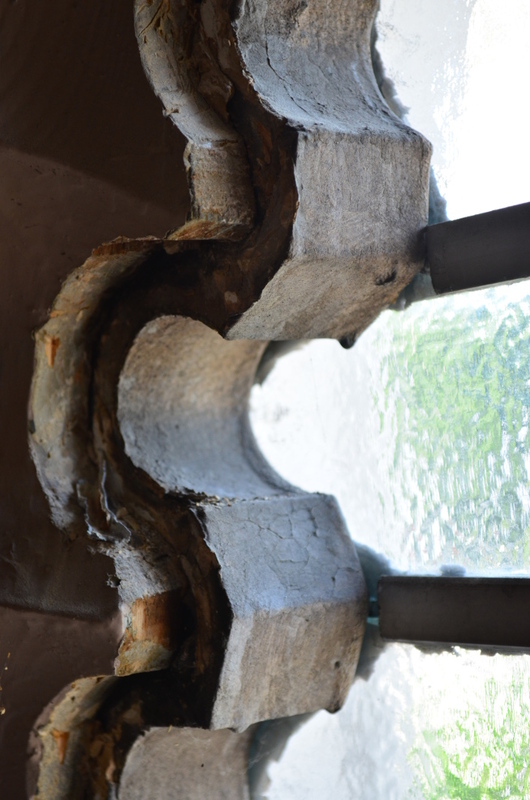 The water-rotted end of this truss was cut out and stainless steel brackets installed between the remaining truss and its bluestone bearing plate. 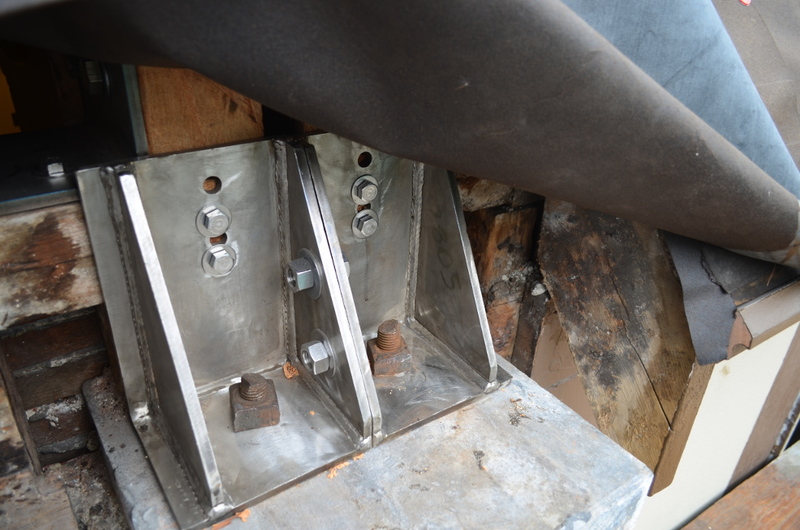 The brackets are anchored to the original threaded rods that descend into the buttress work below. Detail of a rebuilt buttress top. This design sheds water over the flashing rather than over the buttress cap onto the mortar and brick below. 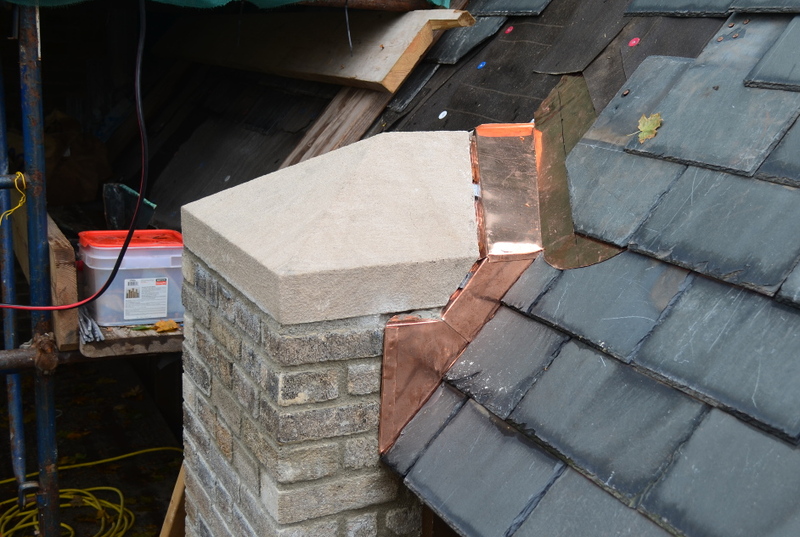 The joint between flashing and limestone cap is yet to be filled. This tracery is about a foot thick and is constructed in a laminar fashion with the molded profiles facing the outside and the interior crafted from old-growth white pine backed by interior blocks of the same material. One hundred thirty years and deferred maintenance left much of the tracery in dreadful repair. A conservative approach was taken to the restoration of these window frames. When possible decayed wood was replaced with like wood in dutchman repairs. When an entire member needed to be removed, it was replaced with a piece carved from Honduran mahogany to match. 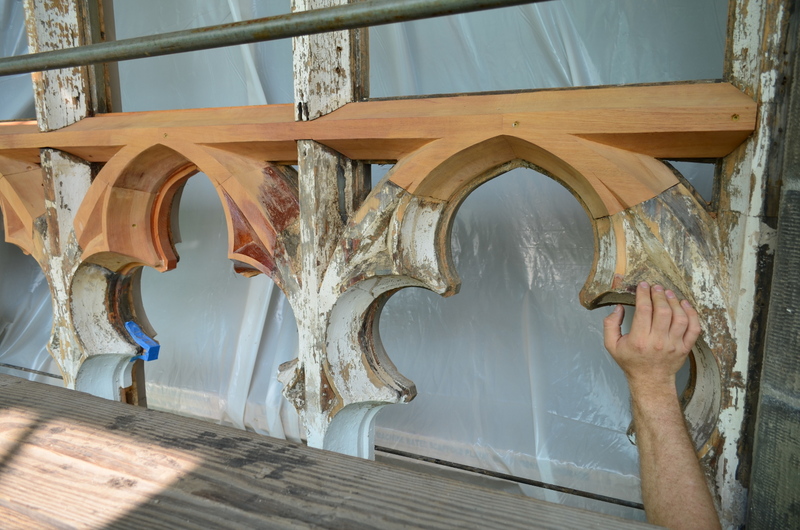 Six master carpenters have restored all of the window tracery. 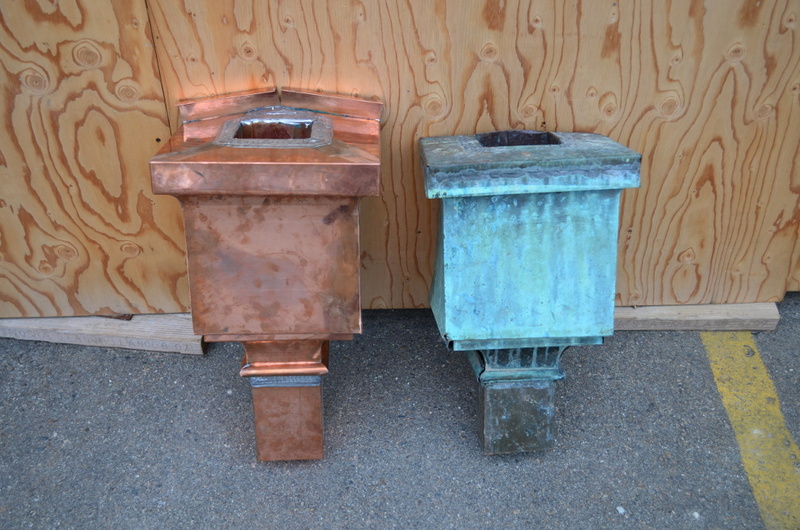 Collector boxes to be installed at the head of downspouts. Notice the angle at the top back of the new box. Almost every window and sash is being replaced or restored. 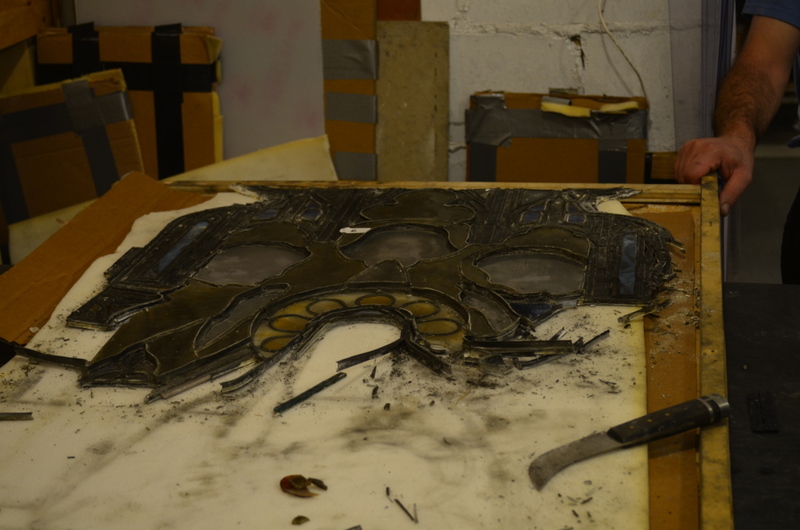 The stained glass, both figural and diamond quarry, in the church is being removed to a Dorchester studio to be taken apart, cleaned, and rebuilt with new lead cames. Where a piece of glass is so fragmented that it cannot be used, a master painter is fashioning a new piece and documenting its placement in the restored window. 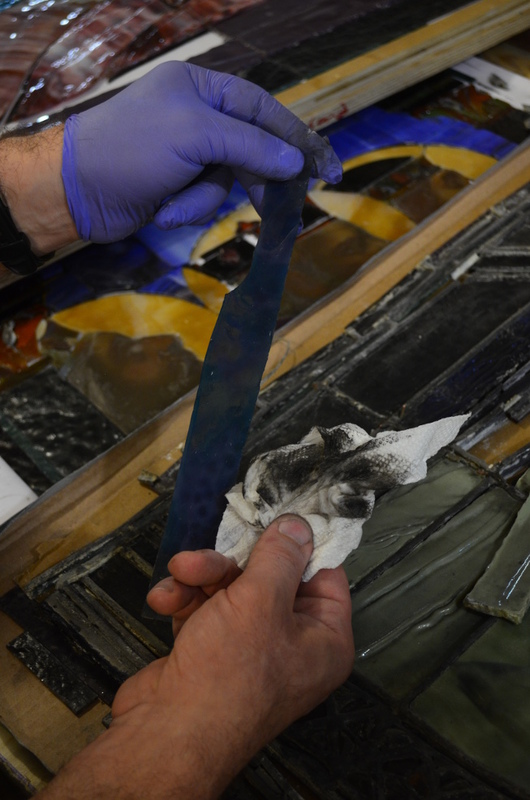 This careful restoration work is being carried out on each of the late-19th and early 20th century windows from such studios as Heinigke and Bowen, Phipps Slocum, Christopher Whall, Charles Connick, and Vaughn & O'Neill. 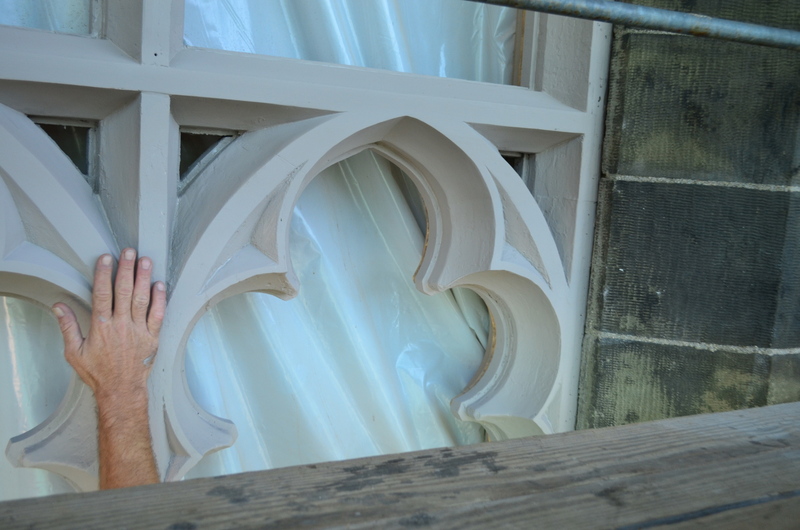 A detail of the window tracery before the protective glazing is installed. Look carefully among the shadows for the seven visible vent holes. These allow up-circulation of interior air from grilled vent holes at the bottom of the window, passing between the protective glazing and the stained glass of each window element, before exiting through grilled exit vent holes to the interior of the building. 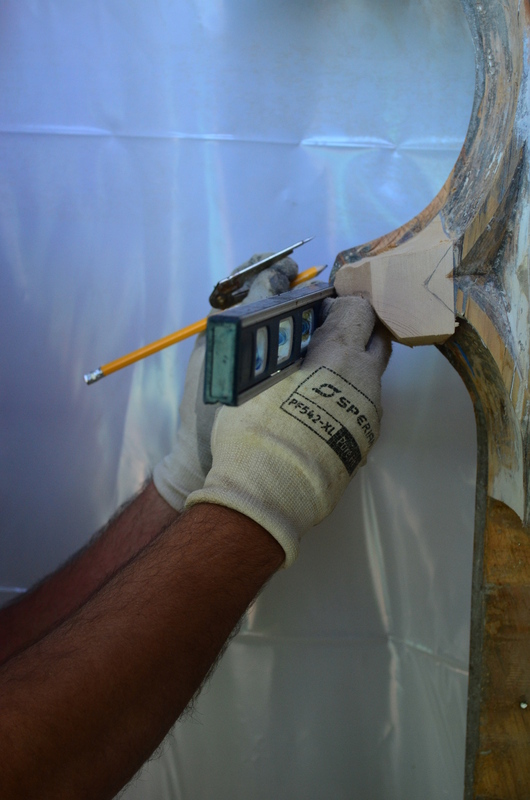 A Consigli glazier fits a segment of protective glazing. 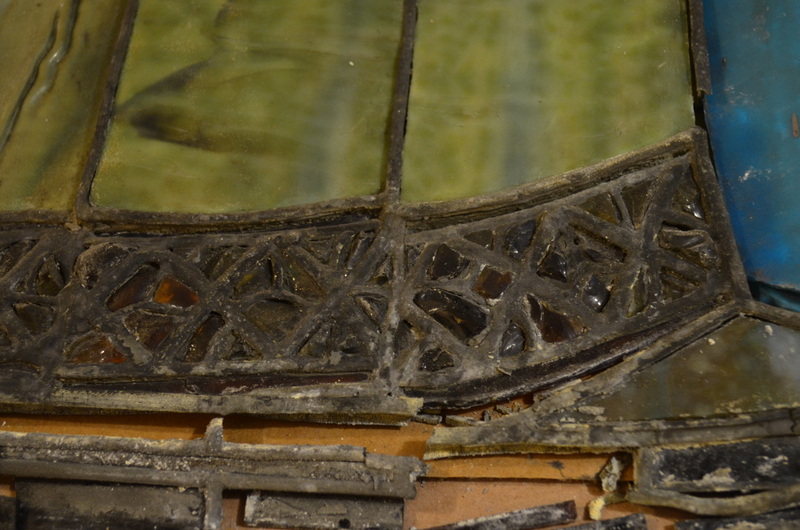 A close look just above the glass being fitted reveals two holes leading up through the tracery to the bottom of the left lancet, corresponding to two vent holes in the photograph above. The parish house, constructed 15 years after the church, is being restored by addressing the same elements as the church. There is still service life left in the slate roof, so it is being selectively repaired with slates taken from the old roof of the church. The gutter, downspouts, and flashing are being completely replaced. 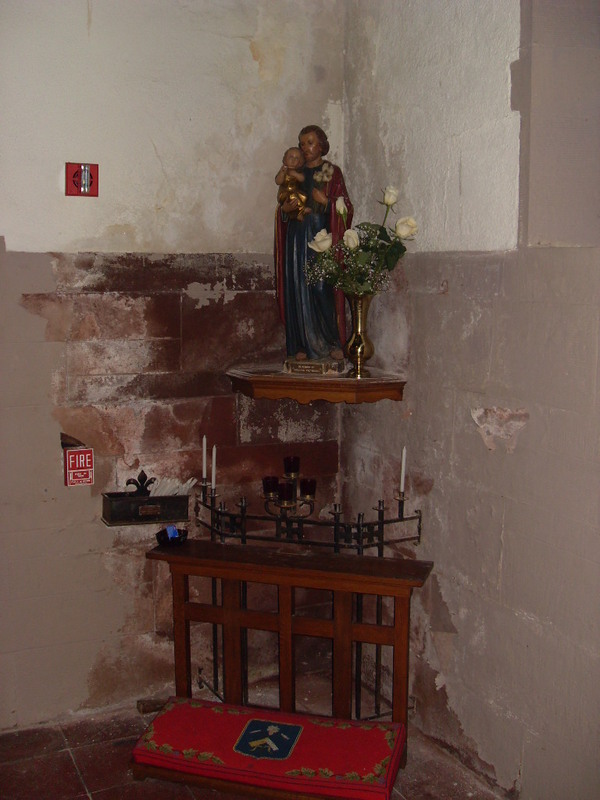 As with the copper work at the church, the materials and profile match the original work. The limestone above the narthex in mid-cleaning. A flaw in the detailing of the parish house buttresses has necessitated stripping the veneer brick and addressing deterioration of some of the roof trusses. 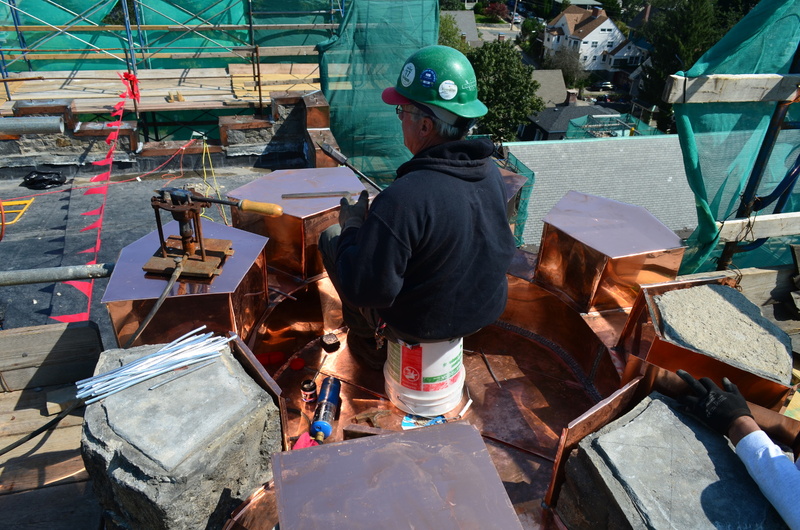 The elaborate copper roof of the large, two-flue ventilator shaft has been completely reconstructed. 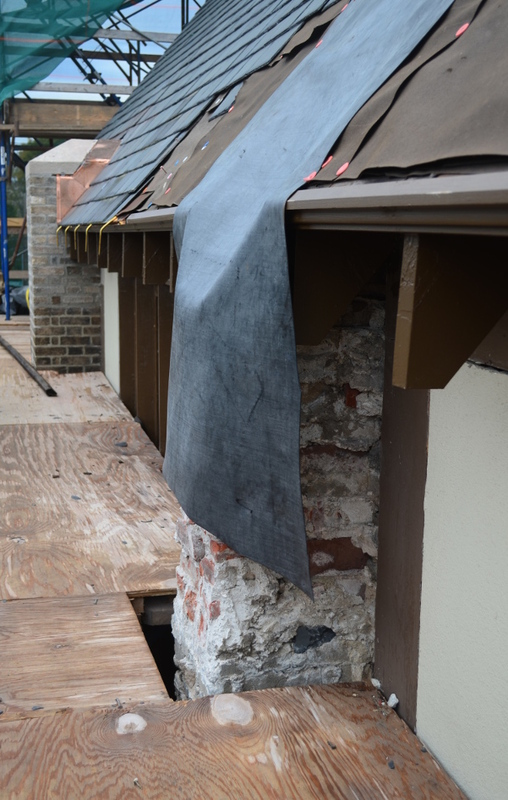 Significant damage to the half-timbering of the parish house has been repaired and patches made to the adjacent stucco. About ten percent of the yellow brick of the exterior has been repointed. Three details from the limestone work above the narthex door. A scrubbed grotesque, still missing his lower jaw, and two partially cleaned vegetative ornaments. 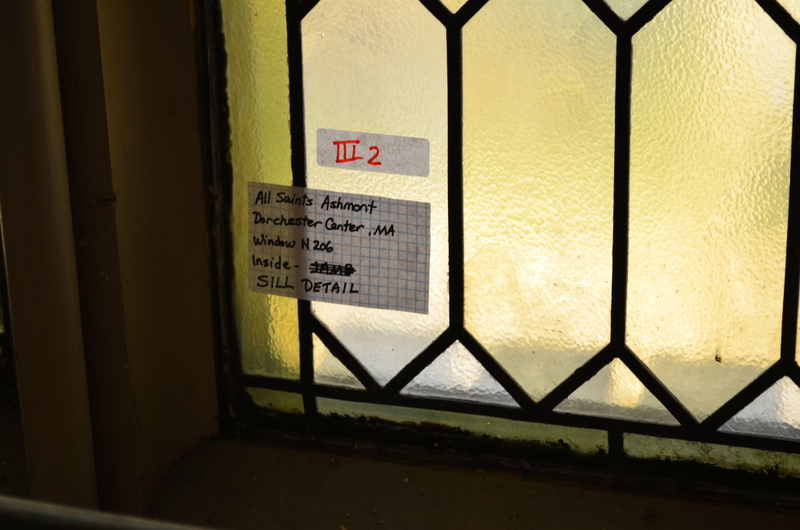 Over the years, the leaded windows in much of the parish house have been replaced with single sheets of glazing. Fabricators located in Antigua, Guatemala, are crafting new glazing for all of the fixed and operable casement and double-hung sash. Where the wooden frames can be restored they are. The metal frames are being restored and reused. Two types of stone repair. 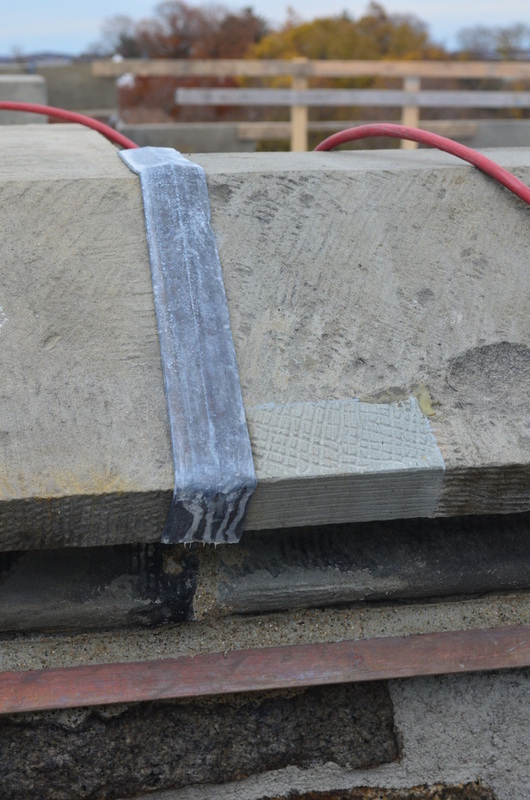 In the photograph on the left, the tower parapet coping stone has been repaired using a dutchman repair. 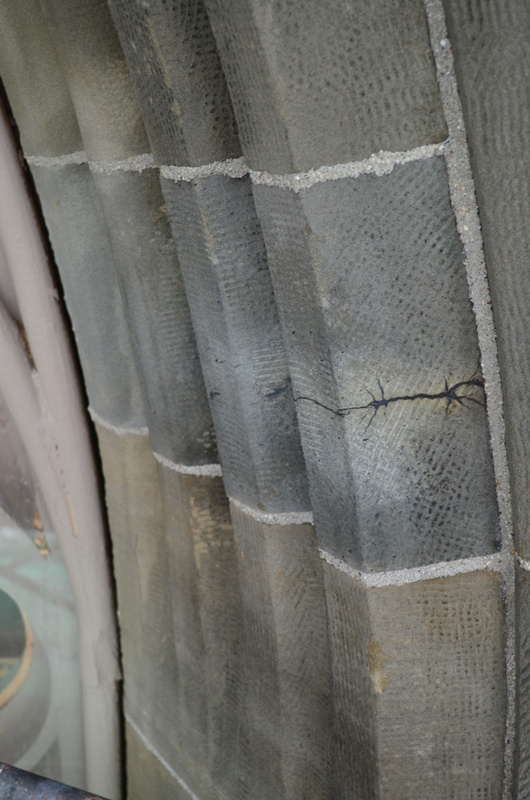 The other photograph show the injection repair of a portion of the stone surround of the great west window. Also included in phase one are improvements for accessibility and convenience. A new, two-stage, ADA-compliant ramp has been installed so that parishioners and visitors may enter through the main door of the church at Ashmont Street. The 1980s ramp into the so-called cloister hall will be demolished. The parish has long labored with inadequate toilet facilities, and this project affords us the opportunity to build toilet rooms with twice the number of fixtures as before. The new women's and men's rooms, located in place of the old nursery, are very nearly finished. The nursery has been moved to the location of the former locker room adjacent to the gymnasium. The entire frame for the south window in Peabody Hall is being replaced. Detail of the replacement frame shown, above. The north prospect of the church looking west along Ashmont Street has long been defaced by aerial electrical cables crossing the street and entering a service head atop a 20-foot length of six-inch, brown painted PVC conduit. The service entrance is being relocated underground, coming from conduits in Bushnell Street to a transformer located at the corner of Lombard Street, and then underground to the undercroft north of the St. Stephen chapel. The east face of the parish house, showing repairs to the window frames, half-timbering, and stucco. 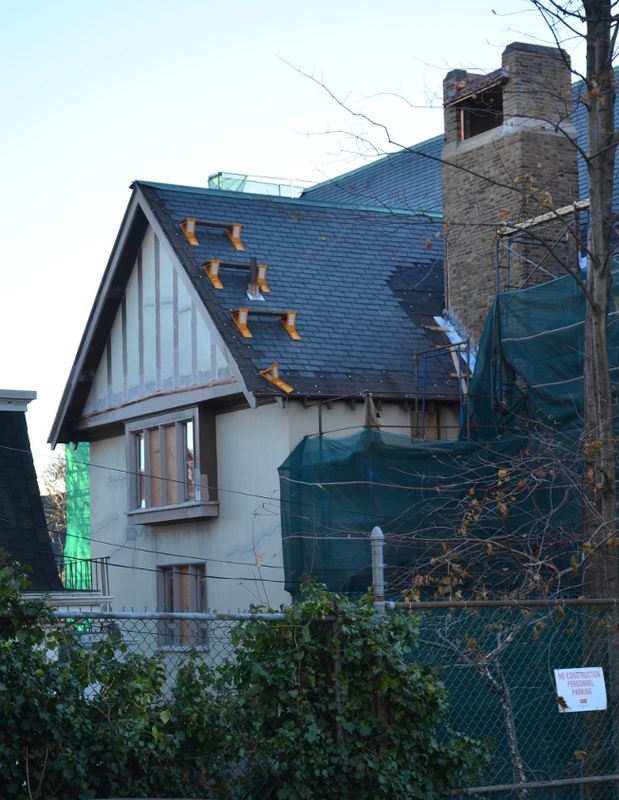 The parish house roof is being selectively re-slated. The second phase of the building restoration is in the final stages of planning as trade-offs between cost and needed work are being evaluated. This much is certain. A significant part of phase two is the installation of an elevator and the construction of a new stair hall to replace the original one. In the foreground, the sheet metal roof for the parish house ventilator shaft in mid-fabrication. In the background: the bell tower. As anyone who has had to go from the first-floor lower hall to the second-floor Peabody Hall knows, this means entering a weird M.C. Escher-like stair hall where one has to descend a half-flight of stairs before immediately ascending a flight and a half of steps. The parish investigated the problem of the stair hall several times over the 20th century without finding a suitable solution that remained within the original footprint. 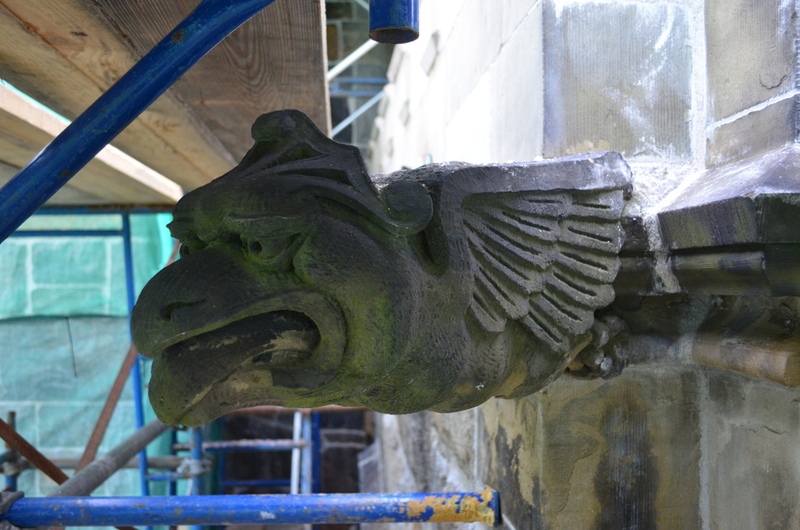 The grotesque at the northeast corner of the narthex in mid-cleaning. The present building project offers the opportunity to rectify the situation by going outside the existing footprint to build a small addition that will house a five-stop, two-door elevator. This addition, positioned north of the cloister, approximately twenty by seventeen feet and architecturally matching the slate, stucco, and half-timbering of the parish house, will afford a gracious new entry to the parish house and cloister. This elevator will make all of the major public areas of the church property accessible. A lift will be installed to provide access to the gymnasium. The construction site viewed from the southwest. The construction fencing encloses the excavation for the new electrical entrance. The transformer will be located to the left of the stop sign. 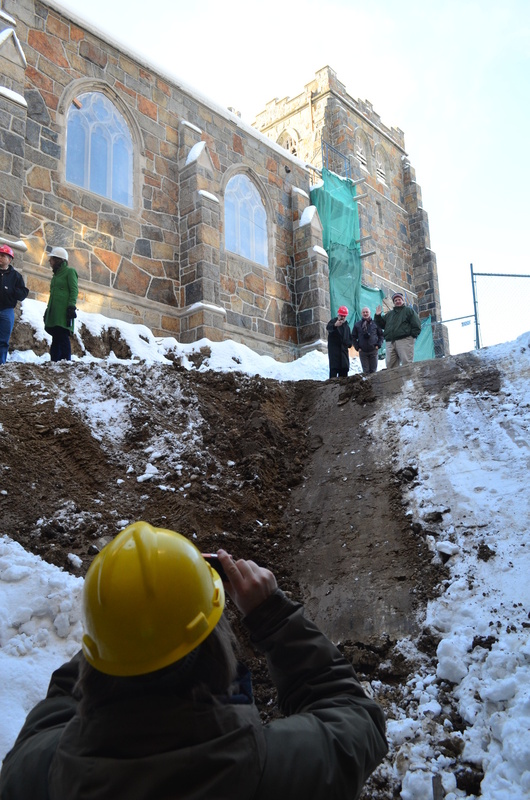 The trenching will parallel the chancel, entering the undercroft to the switch gear just north of the St. Stephen chapel. In addition, the existing restrooms will be renovated and the existing sprinkler system in the parish house will be extended to protect the church, too. The parking lot will be reconfigured and enlarged by three percent to improve vehicular circulation and pedestrian safety, adding three parking spaces in the process. A subsurface infiltration system will be installed for on-site management of storm water from the roofs and parking lot. The entire project is scheduled to be completed by the end of 2014. From the middle of June there have been dramatic changes at Ashmont. 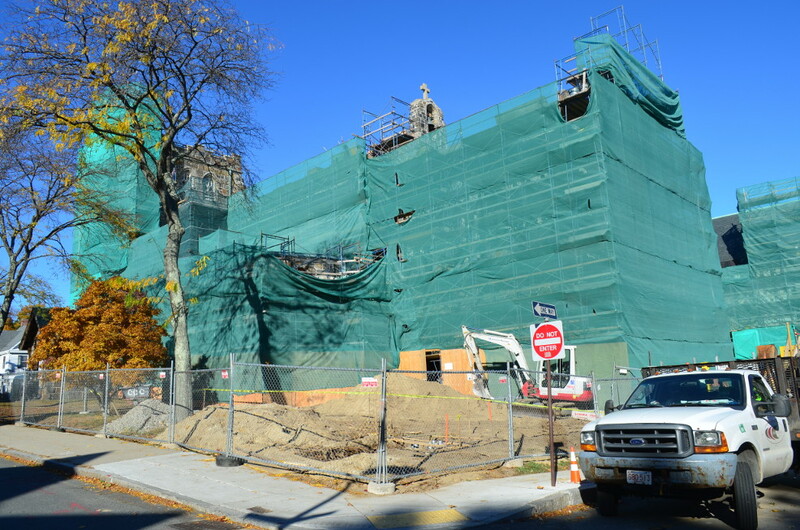 The parish is undertaking a complete restoration of the building envelope, together with the updating of interior systems and finishes and the addition of an elevator and an entry ramp. It is this last item that is most clearly evident from Ashmont Street. 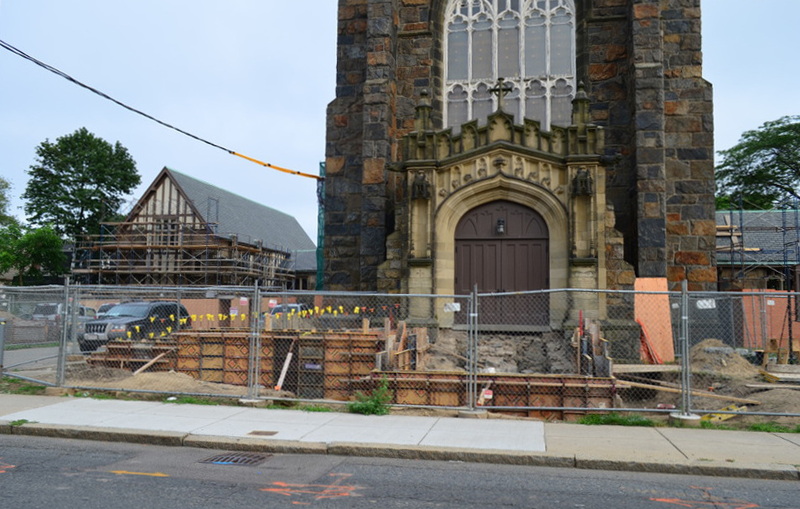 The original granite steps of the north and main entrance from Ashmont Street into the church have been removed and salvaged for resuse, the area for the ramp excavated, footings and ramp walls poured, and forms and rebar set for the reset granite steps and for the rest of the ramp. The original steps were typical for the era when they were installed: there was no railing and the floor of the narthex issued directly onto the top step, not onto a landing. The new accessible entrance will provide a landing at the top of the stair and a ramp will go east along Ashmont Street to another landing and then to a final ramp going south along side the tower to the parking lot grade. We anticipate this new accessible entrance will be open and ready for use in September. 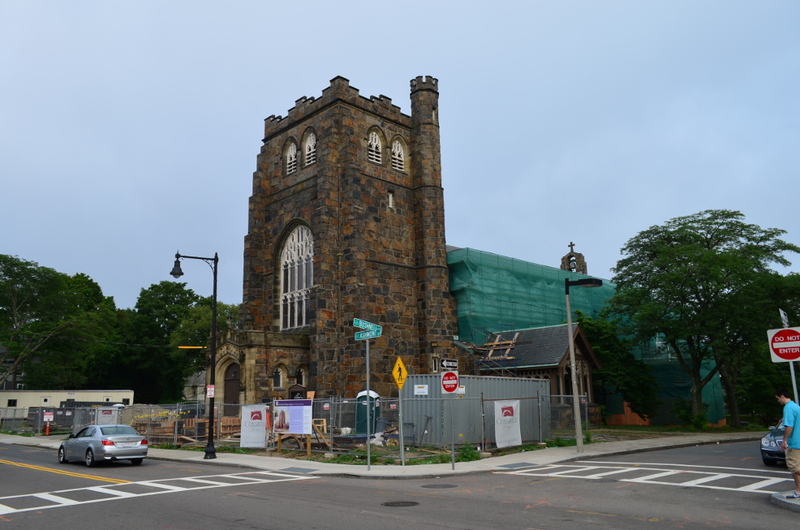 Other visible changes include the erection of scaffolding at the west side of the church along Bushnell Street, at the south side along Lombard Street, along the east side of the church, as well as scaffolding at the parish house. This scaffolding will support the workers as they completely repoint the granite and sandstone exterior walls of the church, repoint much of the yellow brick and sandstone of the parish house, and as they remove for complete restoration all of the windows in the church, both the figural windows at the clerestory and at first floor, as well as the "temporary", rose-colored diamond quarry windows in the clerestory. 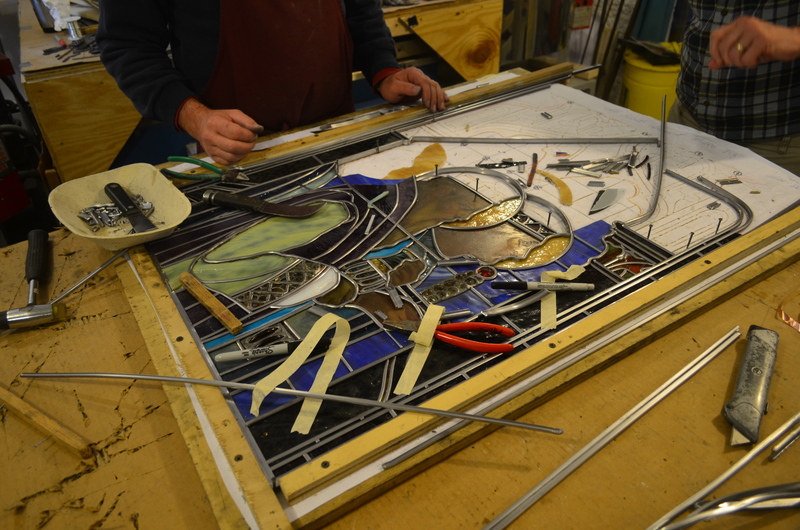 The Great Window above the main entrance to the church, the first to be removed for restoration, is already making its way piece-by-piece to a Dorchester glass studio. Invisible from the street, but no less important is the renovation of the former nursery on the basement level of the parish house into fully accessible men's and women's restrooms. The very first work on the restoration was completed in November and December. 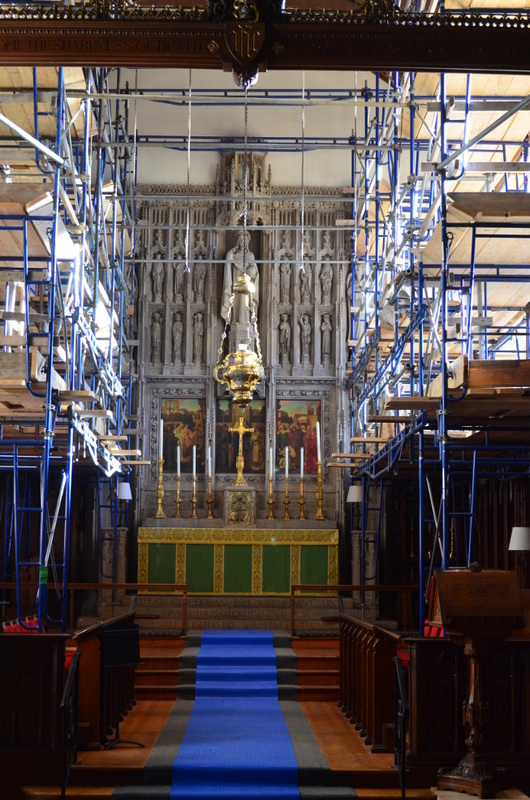 Scaffolding was erected along the church's side aisles and the Lady Chapel, as well as by the tower and on the Lombard Street side of the building. The badly damaged slate on the aisle roofs and above the organ chamber were removed, as was the metal roof of the Lady Chapel. 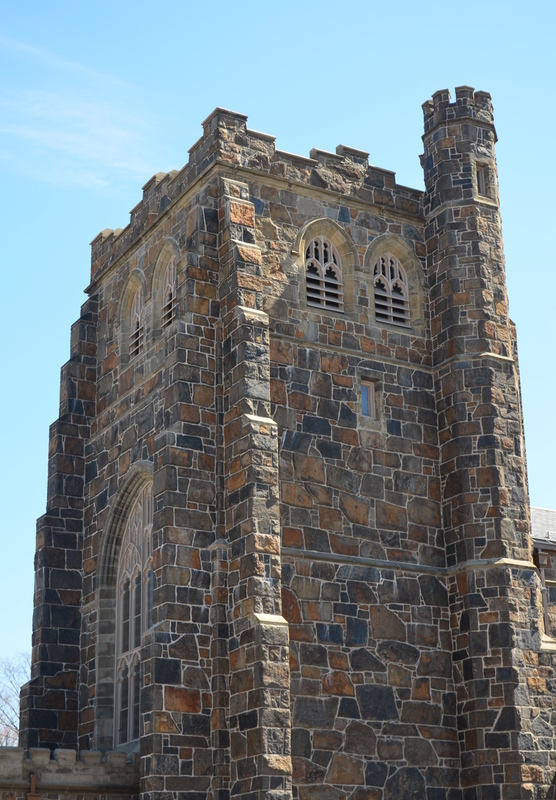 Additionally, some sections of slate were removed from the high roof near the tower and over the choir to allow the architects to investigate the conditions of wood and stone in those crucial locations. 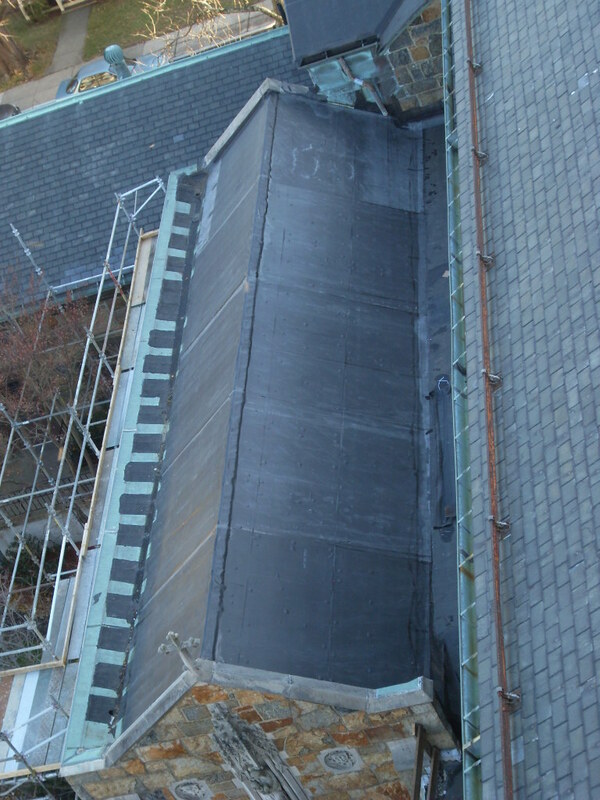 Rubber roofing has been applied to all those areas, to be ultimately replaced with new slate or copper later in the project. This new temporary roofing will yield an immediate benefit, as it will prevent further water infiltration this winter through those particularly compromised areas. The contractors conducted numerous other exploratory "probes," allowing the architects to learn vital details of the actual construction. 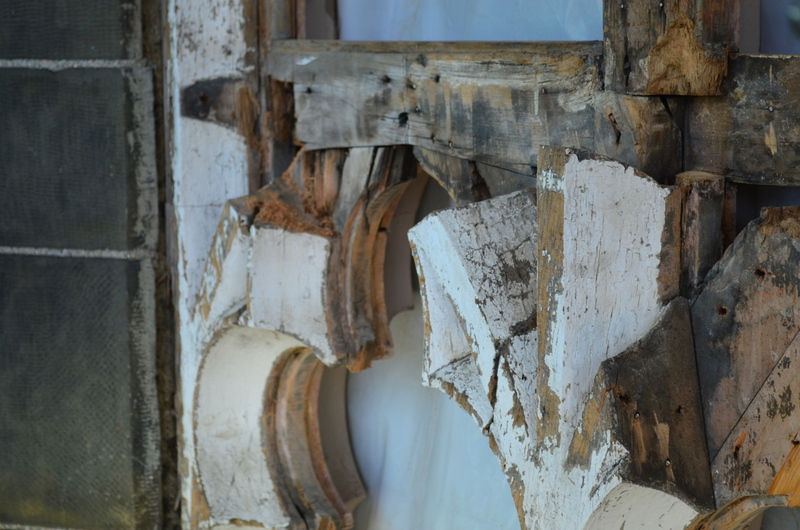 You may have seen the temporary covering of the large holes in the staircase walls as they discovered important information on how the Parish House was built and connected to the existing cloister. Holes were dug in the gym and the basement to examine the footings. 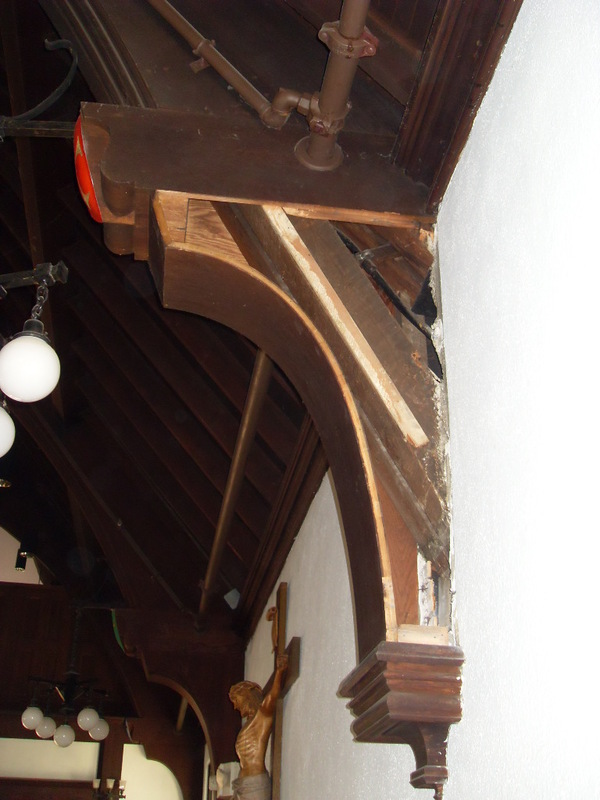 Beams in the Peabody Hall ceiling were opened to examine the structural elements and the way in which they are tied into the supporting wall. The roofing and probes have been completed; the scaffolding now removed. There is much design work to be done this winter before the actual construction work restarts in the spring. 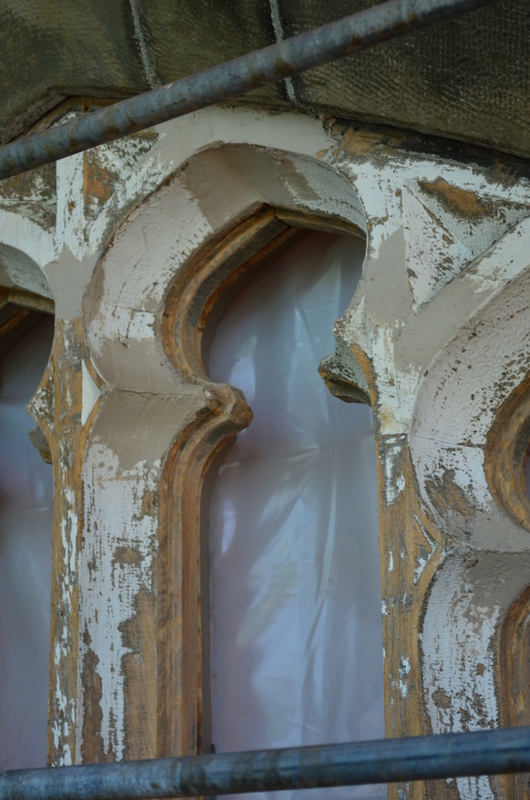 To read more about the building restoration see this recent Letter from the Rector. Considerable progress has been made towards addressing the needs of our glorious – but aging – building. Over a year in the making, the comprehensive study of the structure is in its final draft. It is a massive, detailed report, running to some eight hundred pages. In addition to historical materials, the report documents in detail the current conditions in the building. It also identifies the work that needs to be done to preserve the it for future generations, and prioritizes that work. Since May 2011, a special committee has been meeting every two weeks to plan the project and the fund raising efforts that will allow it to become a reality. We are currently digesting the material in the report and formulating our next steps. The foundation which underwrote the report has recently funded a planning grant which will enable us to plan and cost estimate the first phase of work. 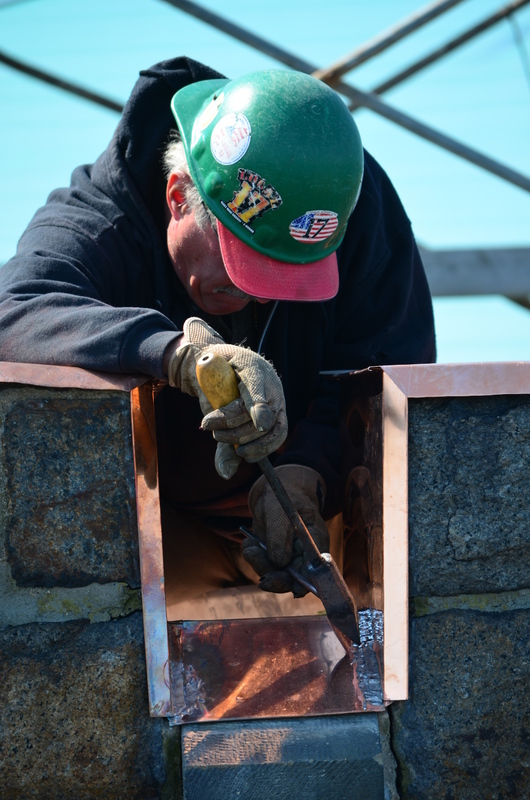 That work will focus on roof replacement and repair, replacement of gutters and leaders, and critical masonry work. We are also moving ahead in making plans for our capital campaign – for, of course, we must do our part to preserve this godly heritage with which we have been entrusted. Check back here over the course of the next few months to see how you can contribute to the preservation this great heritage. 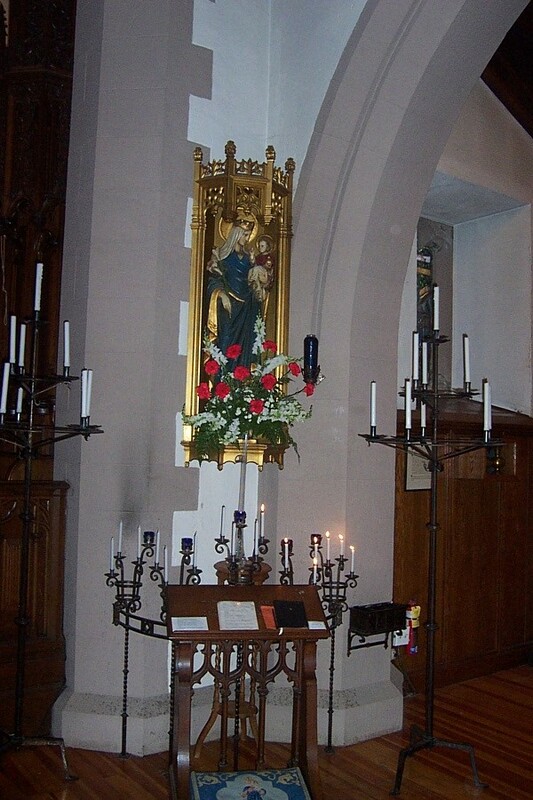 The first two photos above show the Lady Shrine in the nave in 1928 and 73 years later in 2001. The next two photos below extend the view from the shrine toward the St. Stephen chapel to show the effects of water infiltration on the base of the arch into chapel sanctuary. 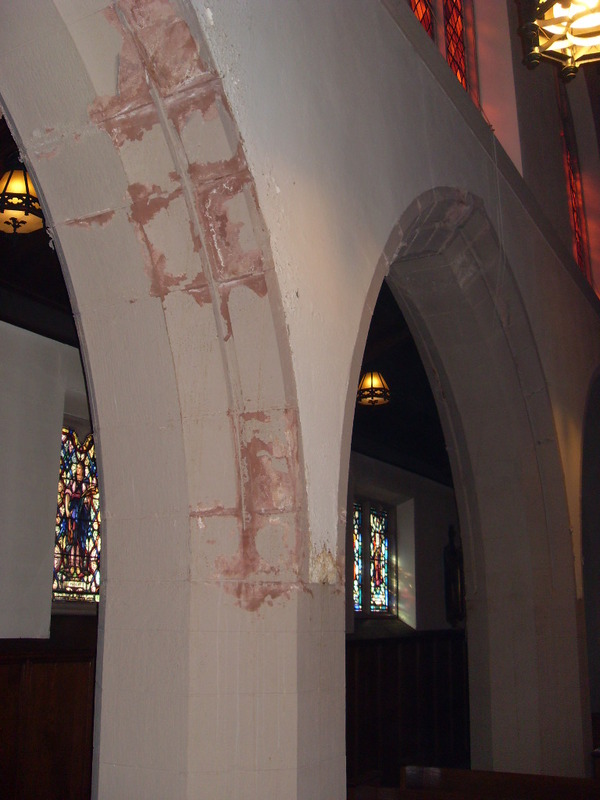 The following three photos show the effects of water infiltration in the second and third arch of the west side of the nave, at the base of the pier adjacent to the confessional, and behind the St. Joseph shrine in the baptistry of the Lady Chapel.